As I posted on Monday, the sights of the Imperium were set on the CO2 Keepstar in DW-T2I. 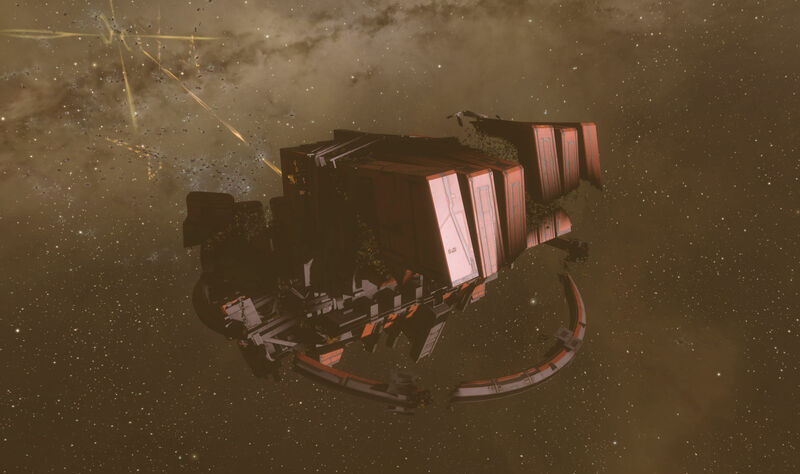 The destruction of this Keepstar has been an operational plan since July, when the first opportunity was thwarted by ignorance about cynojammers. 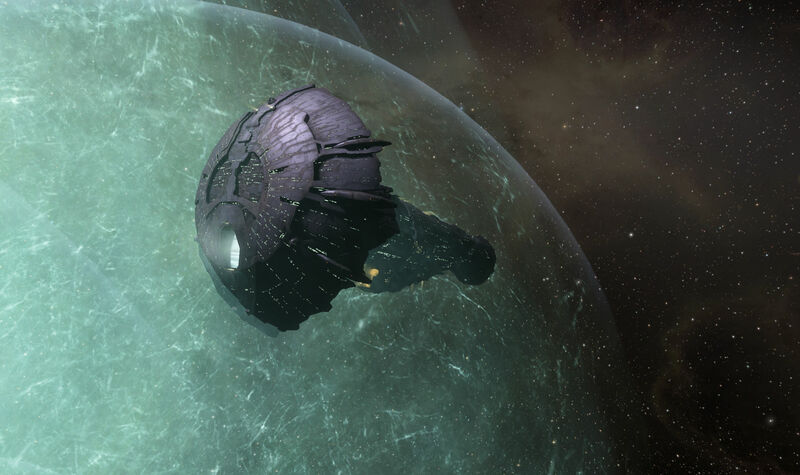 Lots of work since then led to the situation on Wednesday evening when the Keepstar, no longer under the protective umbrella of a cynojammer, came out of its final timer. The question was whether or not there would be a fight. Given that there was no defense of the previous timer and that the Imperium had picked off a number of jump freighters hauling cargo that smacked of an evacuation, it seemed likely that no defense would be offered. But spies were also reporting that the north was trying to rally together a defense, with various organizations sending out pings looking for a maximum effort. However, the north is not like the Imperium. It does not have a unified communications and command structure. So not every entity is on board with every plan. 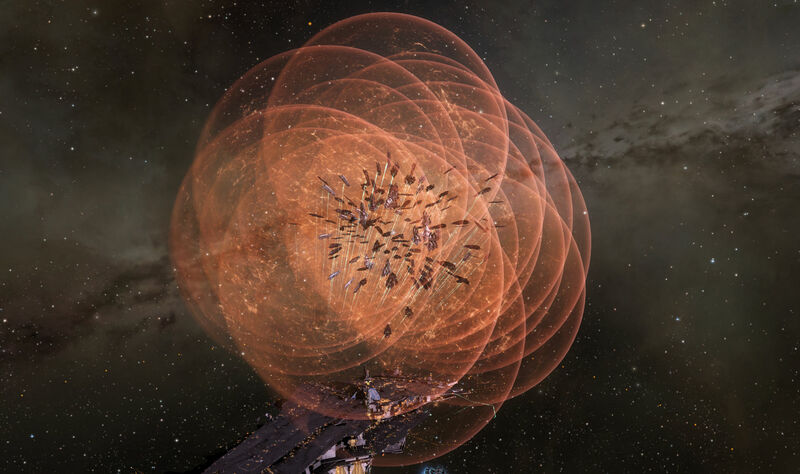 And rumor had it that CO2 was not planning to defend the Keepstar. Whether they saw it as a futile effort or because The GigX, the rumored return of the perma-banned GigX, was himself (or herself if you’re into the “Mrs. GigX” story) banned shortly before the CSM summit, it appeared that they were not going to show up. And it is understandably hard to get motivated about defending something when the owners have given up. We however were planning to show up in force. 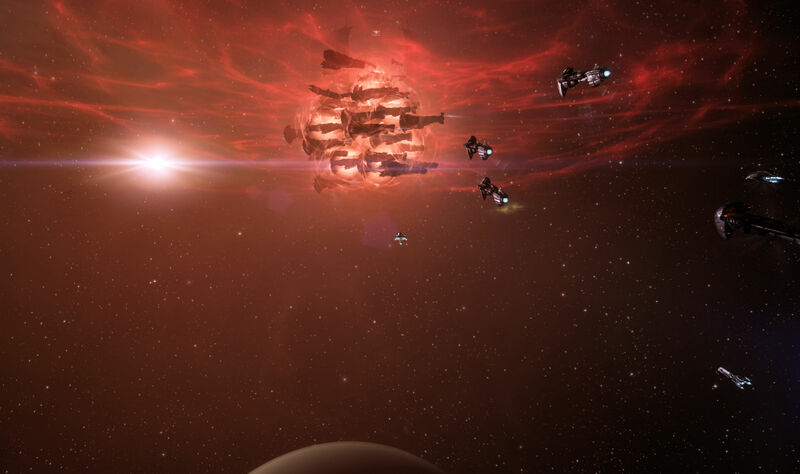 In part that was to ensure if any defense operation managed to coalesced that it could be dealt with, but also because everybody wanted to get on the kill mail for the Keepstar. 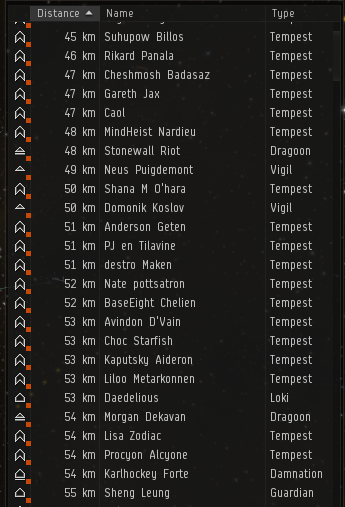 There was actually a list of CO2 structures to destroy on Wednesday, with the Keepstar as the final course. Operations opened with a pair of Baltec fleets forming up to run bridge out and take care of a pair of CO2 Fortizars. I managed to get online and into Apple Pear’s fleet in my Oneiros to go along for the ride, combat drones loaded to be sure I had a chance to get on the kill mails myself. The initial ops were unopposed. The Fortizars were empty and the shoots were quiet enough that one could focus on other thing in the long silences between Apple Pear’s instructions. We were close enough that people packing drones were able to join in on the shoot. We hit both without incident or interference. After the two of those down we went back to 6RCQ-V to stand down for a bit. Not too long after that it was time to form up for the main op. This saw over a thousand people logged into our staging before we started to head out. Again I managed to find a spot in Apple Pear’s Baltec fleet with my Oneiros. The fleet filled up and was sorted out in very short order at which point we were undocked and on our way. We took a gate to meet up with our titan and were then bridged directly to the Fortizar on grid with the Keepstar in DW-T2I. The Keepstar still had more than an hour on its timer, but there were other activities planned for us. There were three other structures coming out of their final timers in quick succession before the grand finale. The first was an Azbel. Once that was down we moved on to wreck a Tatara mining platform that was already being hit. There was a pause after that to wait for the next target, a Sotiyo whose timer had a ways to go. Once that timer hit we warped over to it… all of these structures were on the same grid, so you could see them from our Fortizar perch… and commenced to bash that. The Sotiyo was like some sort of pinata. When it died almost 40 empty Magnate frigates spilled out or were destroyed… or both… as my kill board got credit for them. 40 more frigate kills for me and everybody else who was shooting the Sotiyo I guess. With the Sotiyo down the preliminaries were over and only the main even awaited us. We perched back up, tethered on the Fortizar and watched the super carriers get themselves situated. 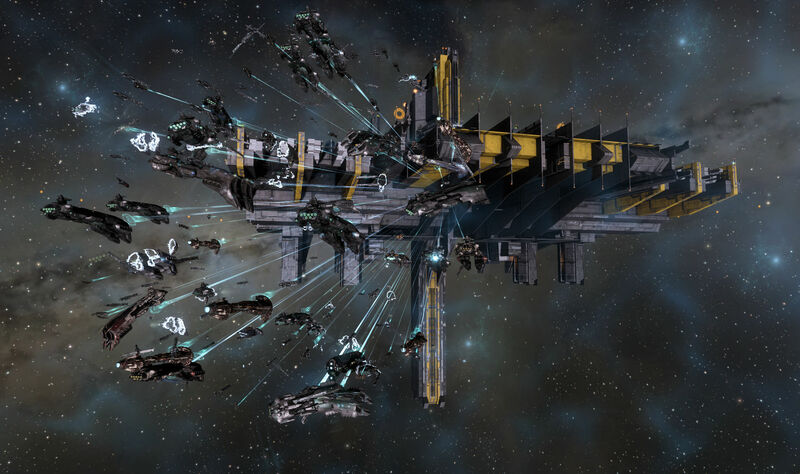 The plan was the same as it was the previous Saturday, with the super carriers launching fighters and sending them over to a command destroyer which formed the first of a chain of such ships that would AOE micro jump drive the ball of fighters to the Keepstar in 100km leaps. This involved a lot of cajoling as controlling fighters isn’t completely intuitive and there is always somebody whose Nyx starts slowly trundling towards the target or whose fighters are headed off into space or end up inadvertently attacking somebody. I feel for them. I did the capital ops class on using fighters then forgot half of it within a day. It is something you need to do a bunch for it to become second nature. Still a lot of fighters ended up on the command destroyer. That screen shot was linked in a ping. 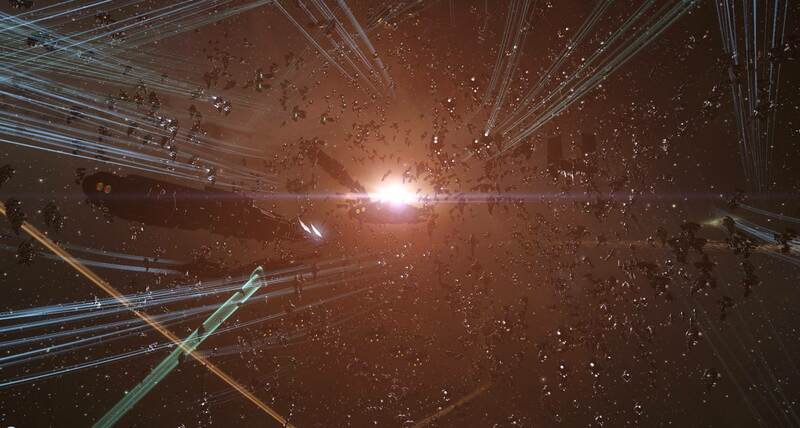 I don’t know who took it, but it shows lots of fighters orbiting, ready for an MJD to take them closer to the Keepstar. Fighters were in place when the Keepstar timer finally ran down. The attack on the structure began as we all sat and watched. The plan was to keep as many people away from the action until the last minute when everybody would jump in or warp to the Keepstar to get in their hit before it died. So we just sat and watched, TiDi free, as the fighters chewed up the structure. There were about a thousand people in local. Then, as the Keepstar got down to 10% the word went out. Cynos were lit. We aligned to the target. And about a thousand more ships landed in the system looking to get in their hit. A host of titans jumped into our path as we slowly warped to the Keepstar, the tidi slamming down on the node, bringing us to 10% speed. We flew on through the titans, and I spotted a Molok as we passed. Things were slow enough for me to notice that. We landed just 30km off the Keepstar. I had prepared for this, loading up a sentry drone in my drone bay. As I came to a stop I dropped the sentry drone, targeted the Keepstar, and engaged. I saw a few hits recorded… and then my client crashed. I hadn’t turned down my graphic settings and I am sure the client went beyond the 32-bit RAM allocation limit and terminated. I was on grid and close proximity with a lot of ships. Fortunately this wasn’t as bad as some of the big fights. I was able to log right back in and re-join the fleet. I had not even warped off as I was still being warp scrambled by the Keepstar, something it does for 30 seconds when you start shooting it. However, my Bouncer sentry drone was still in my drone bay, so something had gone out of sequence. I dropped it again, locked up the Keepstar, and started shooting it again. 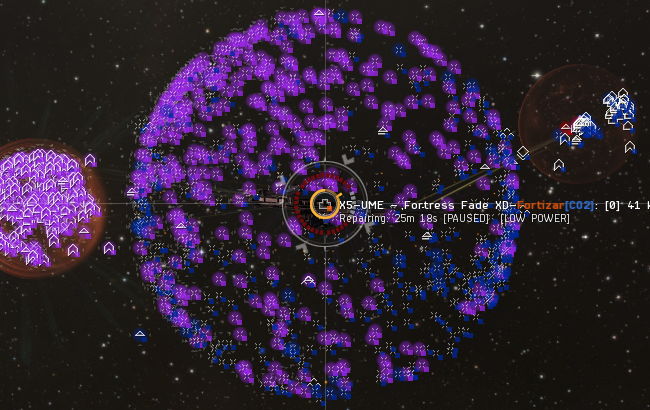 I also zoomed out my camera to maximum distance and turned it away from the fight in hopes of fending off another client crash before the Keepstar died. I also did the control-shift-alt-M command to bring up the client monitor to see how my memory usage was doing. I was riding on the edge there. The Keepstar was done very shortly thereafter. I was even able to recover my Warrior II. The Kill mail shows me… and a lot of people… having done zero damage. But we got counted, which was what mattered. And then began the unwind, the return to the Fortizar, the recovering of fighters, the capitals jumping out, and then finally the subcaps being bridged out. Some impatient people decided to gate home and got caught by gate camps. It was better to be patient. So I managed to get on six structure kills in my Oneiros and never had to rep anybody. I was just looking over the battle report today from all the structures we killed and I wanted to call this out to everyone. Take a look at this Tatara kill. 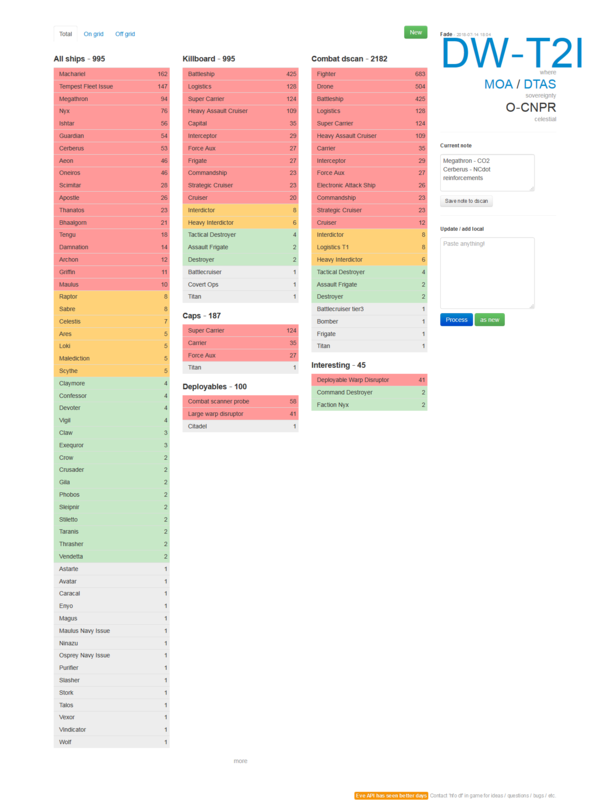 https://zkillboard.com/kill/72384288/ I noticed it’s value was ~ 10b isk so I immediately looked at the rigs. Aha! But what did I discover? 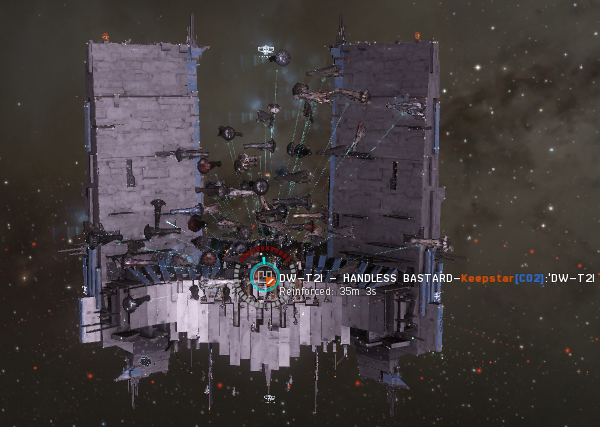 This was a 92 billion isk structure. Take a look at the rigs….both are T2. Zkillboard drastically undervalues them because these rigs are simply NOT sold anywhere in game. Anyone who needs these specific rigs are large, rich alliances – all of whom build them themselves. Go to https://eve-industry.org/calc/ and type in those rig names. That Reproc rig is 66 billion isk. 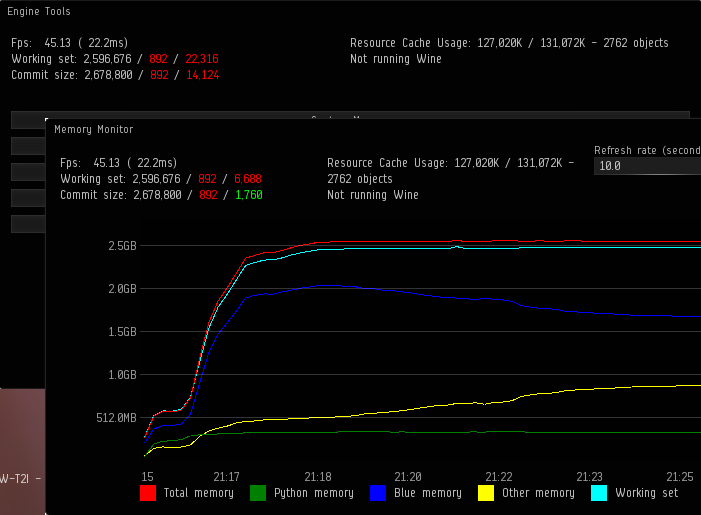 That reactions rig is 15.9b isk. So you can add another 82 billion isk to this killmail to our tally for the day. So we can add that to the value. Through all of this, no defenders stood to. There was a fleet of NCDot and other locals in interceptors hanging around, but they seemed as interested in getting on the kill mails as anything. And now with that accomplished, with the Keepstar in CO2’s capital system destroyed, we get to ask, “What next?” CO2 has other citadels in Fade. 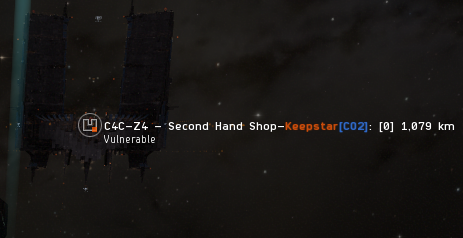 Even another Keepstar. But from what I am hearing CO2 is trying to pack up their citadels and it is now a race to see if we can blow them up before they get carried off. 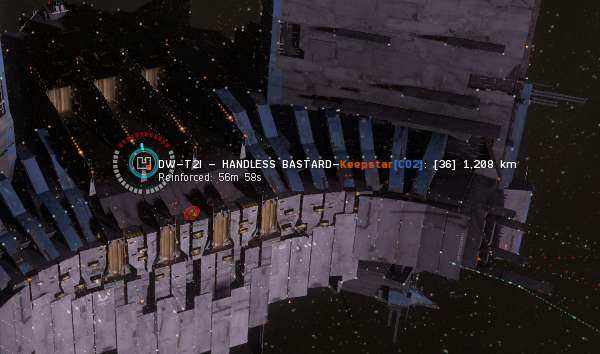 Then there is the NCDot Keepstar in DO6H-Q. The ihub has been cleared there, so that might be on the list of targets as well. After that… well… Mittens says that we don’t want Fade, so we’re not going to take the sovereignty. And we don’t have anybody lined up who wants to take it. But we also don’t want CO2 to have it, so I suspect that we will stay deployed in 6RCQ-V until we’re sure that CO2 has moved elsewhere. 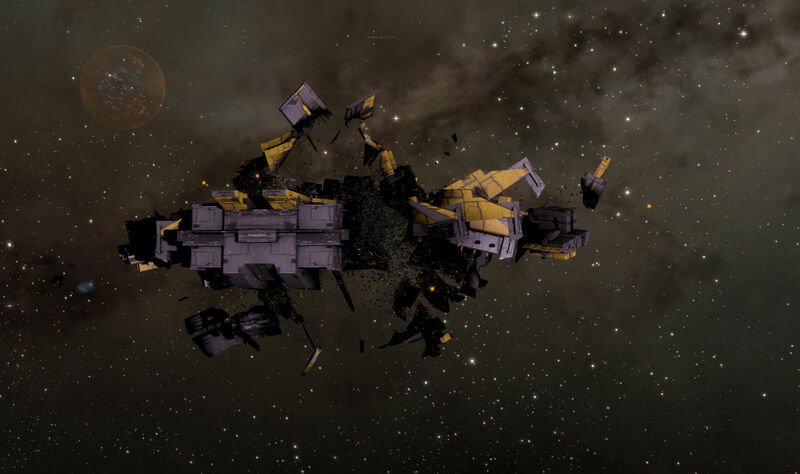 The destruction of this Keepstar took place on the anniversary of the last year’s betrayal of CO2 by The Judge which ended up with the Imperium buying the CO2 Keepstar in 68FT-6 from him, then turning around and selling it to TEST. This is on top of the events of late 2016 when CO2 lost a Keepstar at M-OEE8 when NCDot and Pandemic Legion decided to take Tribute after the Casino War had ended. As an alliance, they have not had great luck with Keepstars. But their leadership made their bed, so they get to sleep in it. 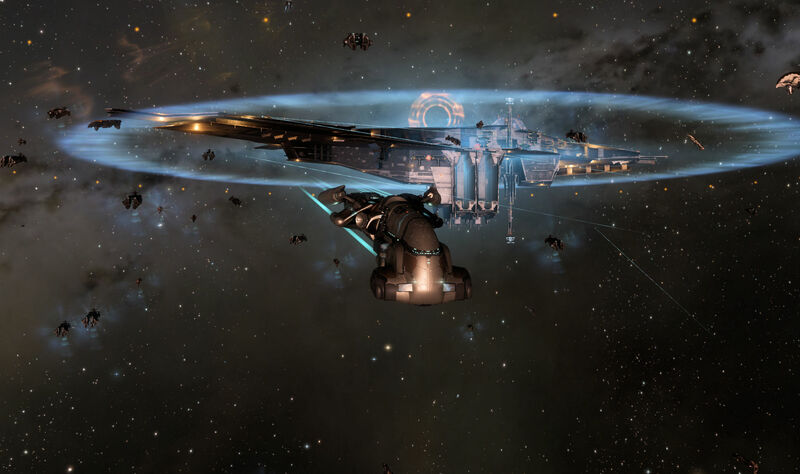 This entry was posted in entertainment, EVE Online, Null Sec and tagged Apple Pear, Circle of Two, DW-T2I, Keepstar on September 14, 2018 by Wilhelm Arcturus. Talk has already started about what various groups are going to do after the war in the north lapses. In part this has been predicated on the assumption that once Circle of Two has been driven out of Fade and their structures destroyed that victory will be declared and the Imperium will go back to accumulating its huge pile of wealth in Delve. However, during The Meta Show on Saturday The Mittani did suggest that we might stay in the north so long as we were getting fights in the Fade region, so we may be sticking around for a while. Either way we have a couple of tasks left. 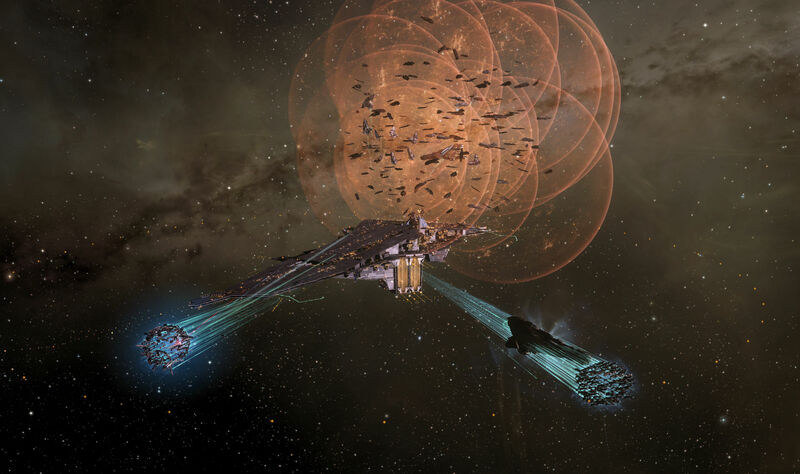 Back in July the CO2 Keepstar in DW-T2I was saved from destruction when the Imperium apparently didn’t know who cynojammer mechanics worked. That was a setback to the Imperium drive to hit CO2. There were other targets though, so the Imperium went after the NCDot staging Keepstar in X47L-Q where the armor and final hull timer battles saw dozens of titans die along with the citadel. There were also NCDot and PL allied Keepstars in low sec that were take out. 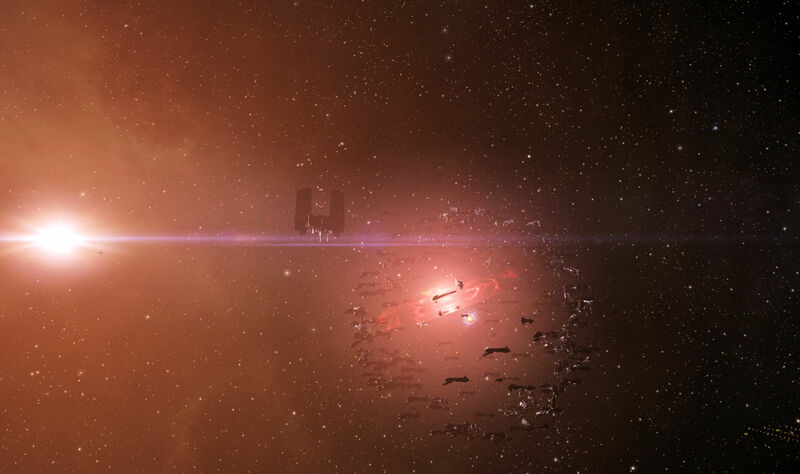 On the southern front, the was seems to have petered out with Fraternity attempting to anchor and subsequently losing a Keepstar of their own. 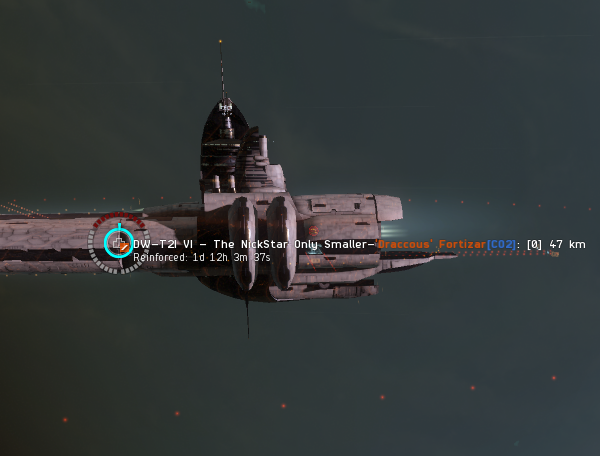 What with all of that and the two Keepstar battles in the south earlier, it has been the war of the Keepstars. During all of that there has been an ongoing entosis campaign in Fade as the Imperium has attempted to remove cynojammers as a factor in the region, allowing it to drop its super captial force at will. The pressure has been on and the north has formed up to defend the critical infrastructure hubs that allow cynojammers to be anchored. But the Imperium has pushed forward, system by system, until last week when the ihub in DW-T2I was finally taken. With that task complete, the CO2 Keepstar was reinforced very shortly there after. 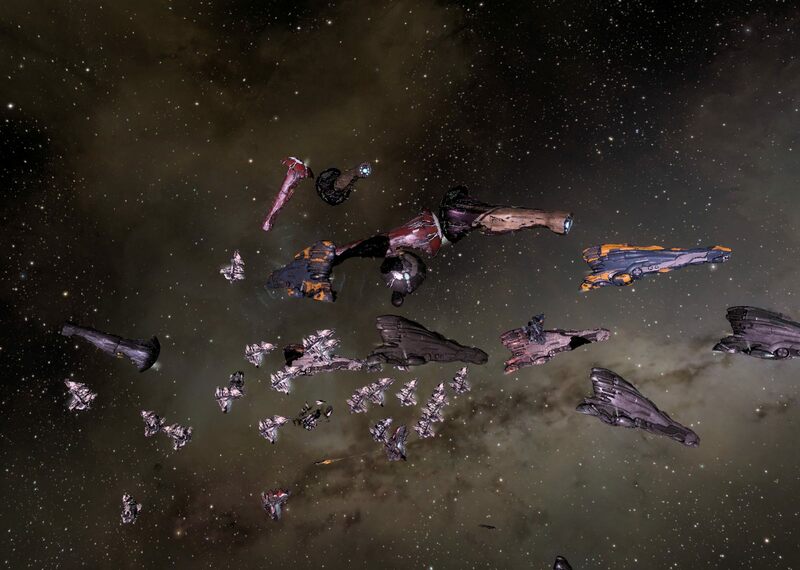 On Saturday fleets assembled for the second of the three events needed to take down the Keepstar, the armor time. Most of this had been happening in EU prime time during the week, when I have been at work. But on Saturday I was able to get to the staging system in 6RCQ-V. With the ping fleets were assembling and filling up. I managed to make it into one of the Baltec fleets, with Thomas Lear in command. Asher the Sky Marshall was in overall command of the multi-fleet operation. We started moving out in a relatively short time span given that more than a thousand characters were logged in and in fleets. The captial ship component jumped off on their own while the subcaps flew off to titans for jump bridges. With no cynojammer available to keep us out, we bridged straight into DW-T2I. Looking over at the timer on the Keepstar, it was clear we were there early. We were clearly not leaving anything to chance. 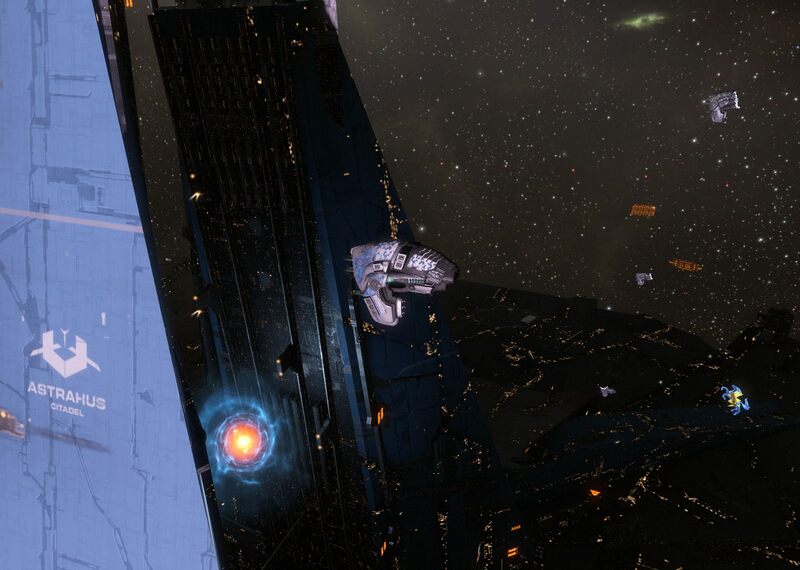 In previous Keepstar fights the armor timer had been heavily contested, so we were there and on grid with the structure to make sure there wouldn’t be any issues on that front. On arrival we tethered up on the friendly Fortizar that had been anchored on the same grid as the Keepstar and waited for instructions. We had not been hanging off the Fortizar for too long before Asher announced from the command channel that the locals were not going to defend the timer. There would be no fight, no tidi, no clash of capital ships. It was also about then that I think people began to notice that Asher had the Real Ultimate Power theme song running on speakers in the background throughout the operation, as every time he keyed up it was there to hear. The YouTube version of the song had been discovered earlier in the week and I am pretty sure he had been playing it non-stop ever since. Like ninjas, Sky Marshals are also mammals and are also fight all the time. Except when the enemy doesn’t show up. While the enemy was now not expected to take the field we still piled into the system, likely both as a show of force and to keep the locals from changing their mind. A few tasks were handed out as we waited for the timer. 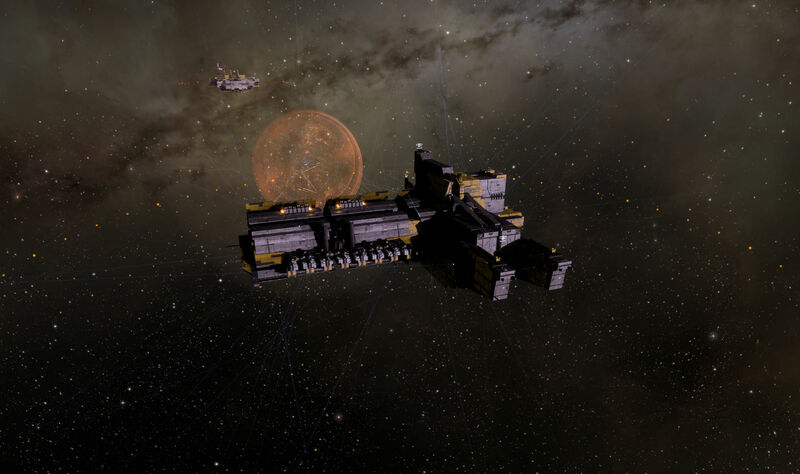 Our fleet warped over to an Athanor mining platform in the system to reinforce it. Being in Reavers, shooting structures is practically a way of life. With a full fleet though that did not last very long. 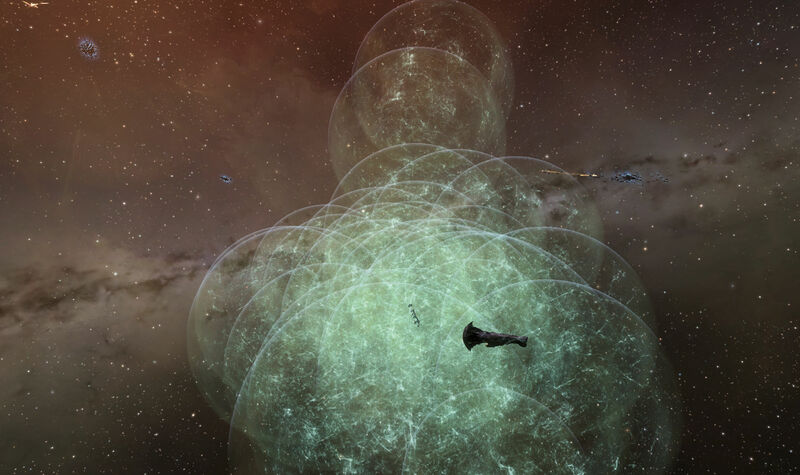 Soon we were back hanging off the Fortizar on our tethers wondering if anything would happen as the timer for the Keepstar counted down. A supercarrier fleet jumped to the Fortizar and tethered up above us with heavy interdictors putting up defensive warp disruption bubbles around the supers to keep anybody from warping directly on top of them. 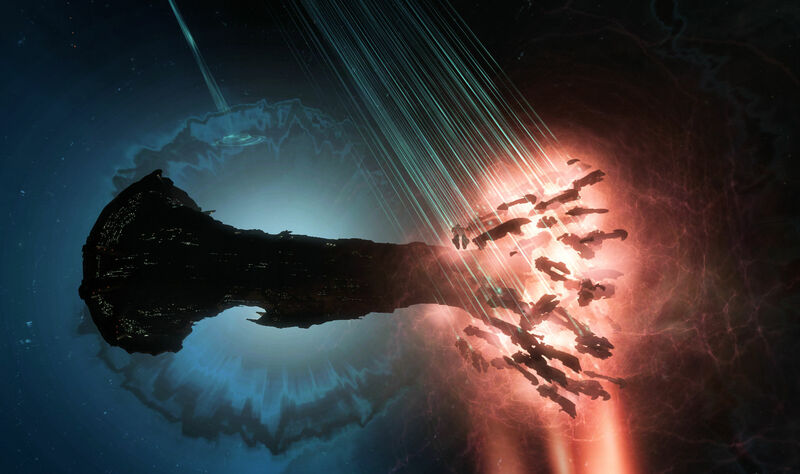 Fighters from the super fleet were tasked to do the actual attack on the Keepstar and most of the voice coms traffic involved getting their fighters deployed and to the right location. Even that coms traffic died off after not too long and things were pretty quiet. I took off my headset and let coms play through my speakers while I made a snack. As I ate that I started to sketch out some ideas in a blog post draft that eventually took form and became the post about acquisitions and CCP that went live on Saturday. I suppose it is a productive fleet if I end up with two blog posts out of it. The timer came out and the supers hit the Keepstar. As expected, there was not much in the way of resistance. A few CO2 pilots undocked to try for targets of opportunity and a Pandemic Horde interceptor fleet shadowed us coming and going, but neither were going to change the expected result. 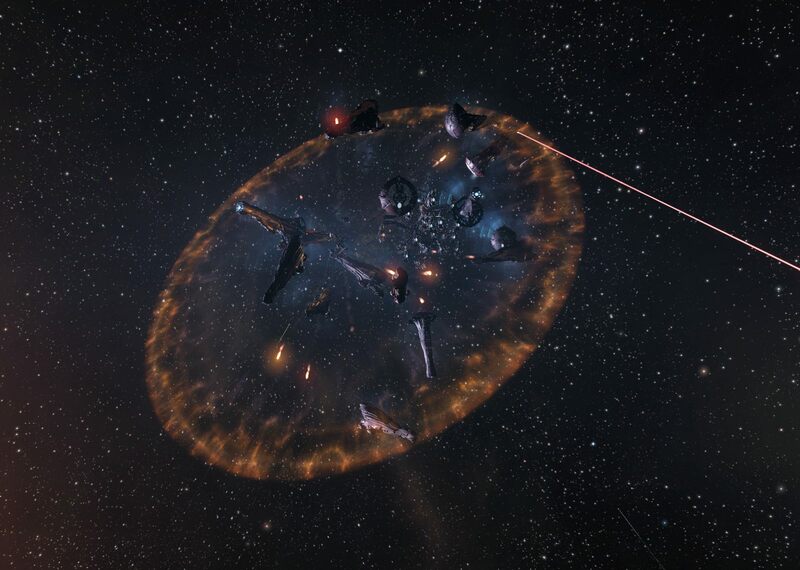 The Keepstar itself was gunned and managed to pick off Xenuria when he strayed too close and got hit by the PDS. But the fighters were successful in getting through the armor of the citadel and the timer for the final event was set. That timer puts the final fight on this coming Thursday Wednesday. With the timer set in DW-T2I we withdrew back to our own staging in 6RCQ-V. Rumor has it that the final timer will not be contested either as CO2 is already well under way evacuating assets to the Keepstar in DO6H-Q. 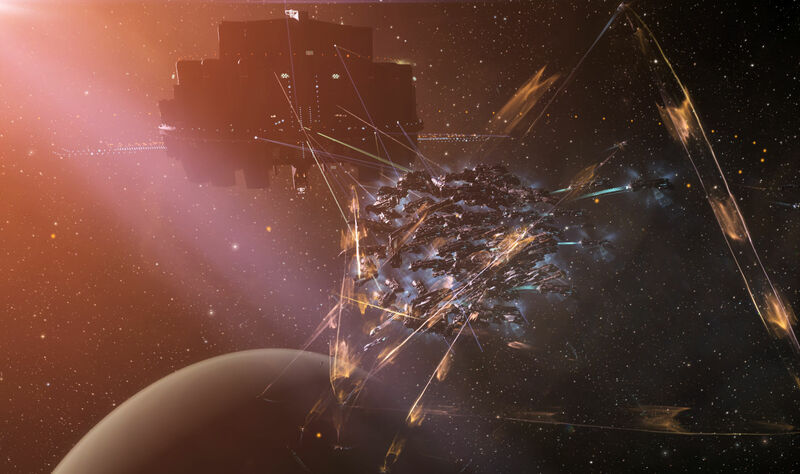 However, the ihub in DO6H-Q was also taken by the Imperium over the weekend, leaving the Keepstar there unprotected by a cynojammer. It seems quite likely that we will stick around until that too has been destroyed. This entry was posted in entertainment, EVE Online, Null Sec and tagged Asher Elias, Circle of Two, DO6H-Q, DW-T2I, Real Ultimate Power, Thomas Lear on September 10, 2018 by Wilhelm Arcturus. After the climactic battle over the NCDot Keepstar in X47 the headline level events in the north dried up a bit. The war carries on though and, while titans aren’t occluding the sun in mass blobs as often, things are happening. Things are once again focused on the Fade region where Circle of Two lives. Given CO2’s position at the top of the list of Imperium enemies after their betrayal in the Casino War means that it is no surprise that we are camped on their doorstep. The defection of The Judge and the subsequent downfall of CO2 in Impass, which included GigX being banned from the game, was not enough. CO2 is back on the sov map and, more importantly, GigX is back, perma bans being transitory things I guess. And so everybody is formed up in and around Fade. 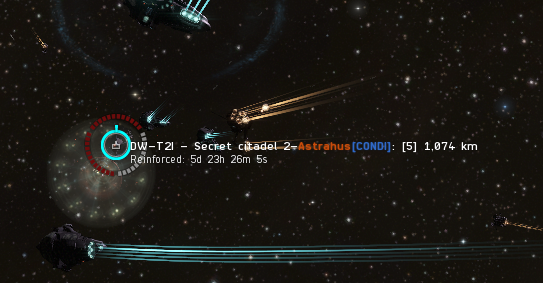 CO2 remains in DW-T2I with their Keepstar, which we failed to kill previously due to not understanding how cynojammers work. 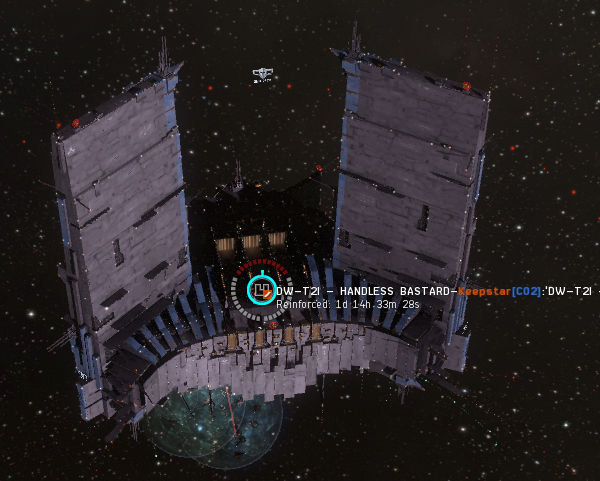 Other northern forces are staged in DO6H-Q where NCDot now has a Keepstar. 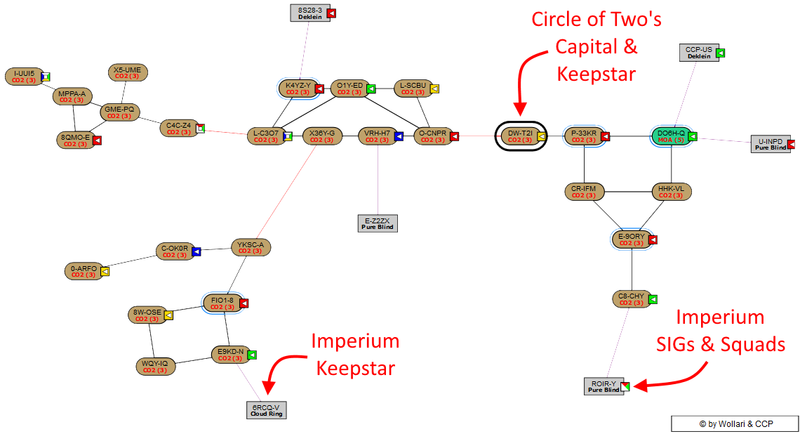 The main Imperium staging is at the Keepstar in 6RCQ-V, planted there back in July. And then there are the Imperium SIGs and squads in NPC Pure Blind, where we have been knocking about, dropping on local ratters and miners, and deploying structures since at least last November. Longest deployment ever. My annual Reavers review post is going to be all about Pure Blind. The target for the Imperium remains, as I expected, the CO2 Keepstar. But to be able to go after that we have to disable the cynojammer which means killing the infrastructure hub in DW-T2I so that our mighty blob of titans can drop on it the way it did in X47. Doing that means entosis warfare and all which that entails. 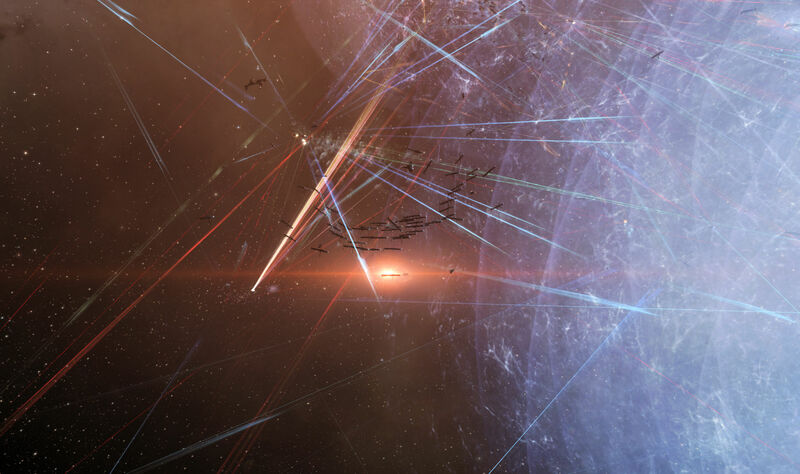 The Imperium has been chewing on the near end of Fade, attacking both ihubs and TCUs. If you look at the Fade map at DOTLAN you will see a couple more systems have been turned since I made the map above. But all that has been a mere clearing of the brush between the Imperium and its target. 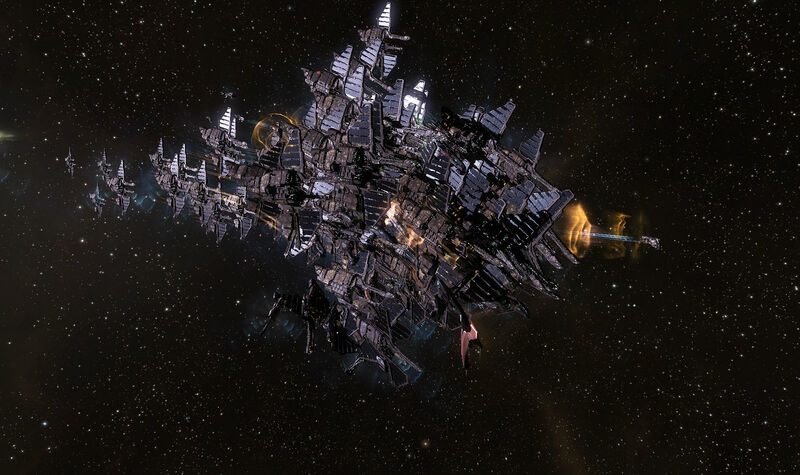 It is the ihub in DW-T2I that is the real objective, the necessary first step towards destroying the CO2 Keepstar. We had a shot at the ihub on Saturday. Early evening on Saturday EU time, and mid-morning Saturday at my end of the world, pings went out for form up for a run at the ihub. It actually came about an hour earlier than had been announced, but I was up and wandering about the house, so saw the ping and was able to get into a fleet just before we departed. The Baltec fleet was full when I got on, but there was also a Jackdaw fleet coming along, so I joined up there in a Jackdaw. I had one of those handy already and didn’t want to buy a Scalpel just to fly logi. I am already accumulating ships in 6RCQ-V, something that happens every deployment. Anyway, I wasn’t in fleet for long before we were undocking and getting to a titan to bridge out towards our destination. After jumping through we followed the Baltec fleet through a gate and into CR-IFM where a fight erupted around the gate. The locals and their neighbors had formed up in greater numbers than we expected, their Muninns all over the place. While we were killing things, we were not exchanging well, and the Baltec fleet logi seemed to be taking an especially hard pasting. 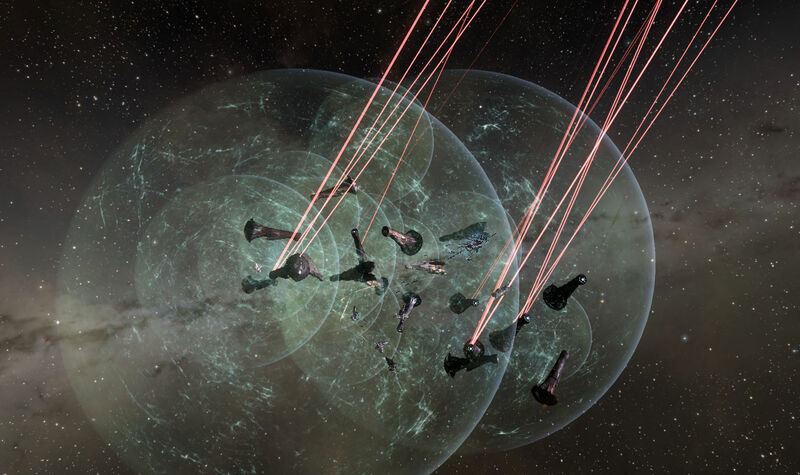 Apple Pear, who was leading the op, had us align to a friendly Raitaru in the system and burn out of the bubbles, shooting any hostile interdictors that showed up. We cleared out, leaving the field crowded with targets for a bombing run by pilots from Initiative. 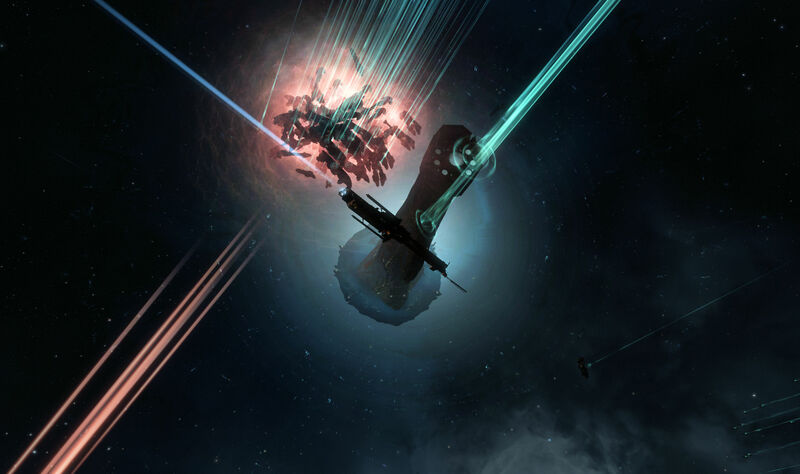 That tipped the overall ISK exchange in the fight well in our favor accoring to the battle report. However, any thought of contesting the entosis event for the DW-T2I ihub went out the window. A weekend in the EU evening time slot was just about optimum for the defenders, who tend to be stronger than us in that time zone. 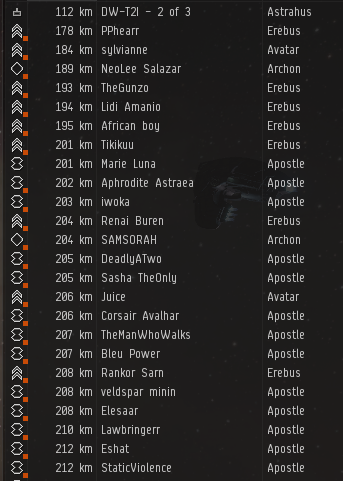 On the Raitaru Apple Pear had us dock up and log off. The plan was to go away for a few hours and then log back in to make our way back home when the system wasn’t camped and ready for us. And so we logged off and went and did whatever it was we had planned for the day. The ping for the extraction came a few hours later with a five minute warning to get in or be left to your own devices. Of course, I only walked by my computer and saw that about ten minutes after it went up. At that point I should have just kept walking and come back late in US time to fly out on my own. But I thought that if the fleet was leaving then they would be headed towards Cloud Ring and our staging I might be able to head the other way towards Pure Blind and slip out. I undocked and even as I started into warp I knew I had made a mistake. Despite having a perch well off the gate already bookmarked I warped straight to the gate and landed in the bubble I fully expected to find when I got there. Dumb once again yields a dead ship. At least I had an empty pod and was sent home the fast way. In any case, I was headed the same direction that the extraction fleet was, so all eyes were on my route and looking for stragglers, so it was a poor choice. The nice, clean DOTLAN region maps don’t really show the distances between the systems in space. If you using the jump planning map you’ll see if you’re going to bridge out there are places in Pure Blind closer to Cloud Ring that the systems at that end of Fade. The morning’s operations were enough to put the system at the top of the list for kills in 0.0 space. Not a huge battle, but the biggest one on Saturday. Operations picked up on Sunday where we repeatedly clashed with the locals, killing enough Munnins that I have to wonder if the price on those are going to start climbing. 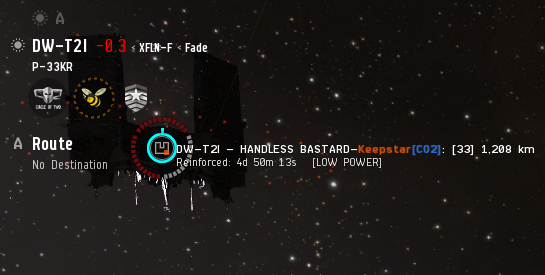 In the end we managed to entosis the ihub in DW-T2I again, so we are set for another clash. This time it will be on Tuesday in EUTZ, when I am at the office. I will miss it, but I am sure everybody will carry on without me. We will see if a weekday time slot works out better for us. 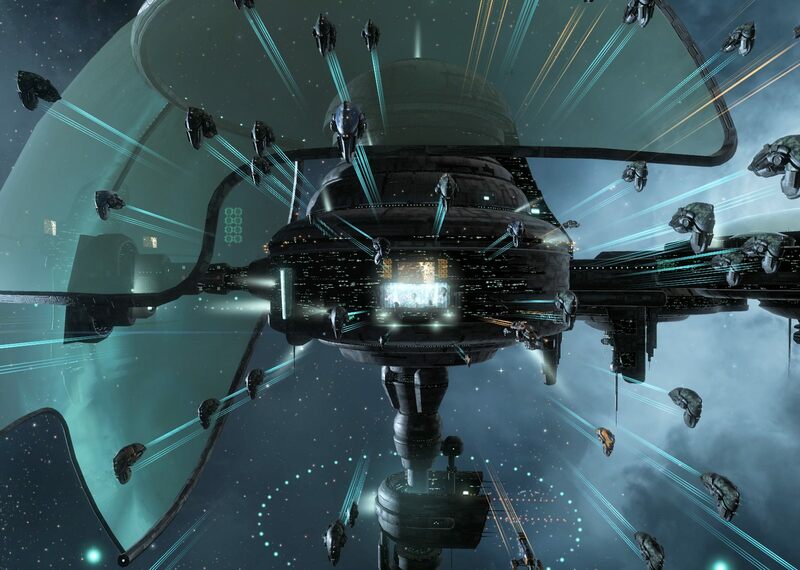 We only have to win the ihub fight once to move on to the Keepstar while the locals have to win it every time to keep it safe. 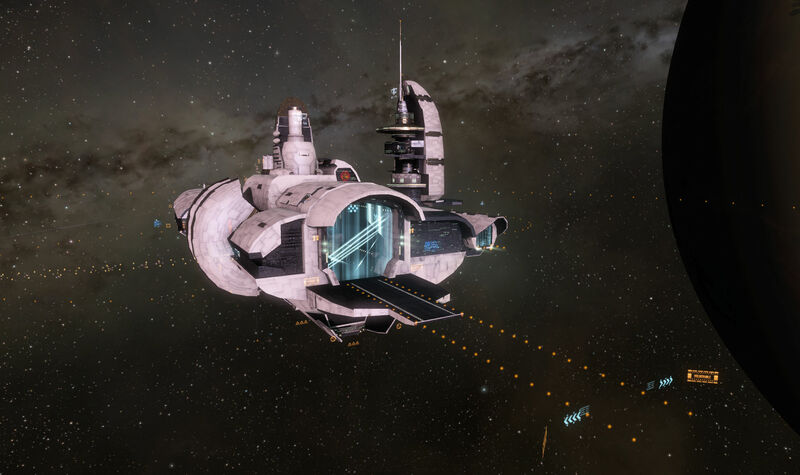 This entry was posted in entertainment, EVE Online, Null Sec and tagged Apple Pear, Circle of Two, CR-IFM, DW-T2I, Fade on August 20, 2018 by Wilhelm Arcturus. 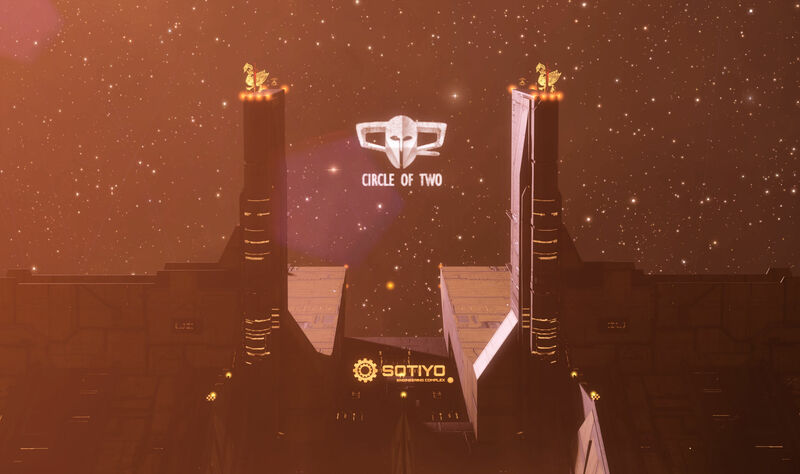 After laying down a Keepstar in Cloud Ring last week, the Imperium went straight to work on Circle of Two, reinforcing their Keepstar in DW-T2I the next day. The Imperium staged in Cloud Ring meant that most of Fade was in capital range, if those capitals took the gate between the two regions. With the Keepstar in DW-T2I reinforced, the next big even was set to be the armor timer. To destroy a fueled citadel you have to go through three battles. The first is the shield layer. You can attack at any time and if you get the citadel’s shields down to zero, a timer comes up. When that timer finally counts down the citadel goes into a 15 minute repair cycle. You have to form up and shoot it again, this time shooting its armor layer down to zero. By applying enough damage you can stop the repair cycle and get through the the final timer. When that comes up you do the same thing again, only shooting away the structure. If you succeed, the citadel blows up. If you fail, you get to start all over again. So it was the second round, the armor timer, that came up yesterday. 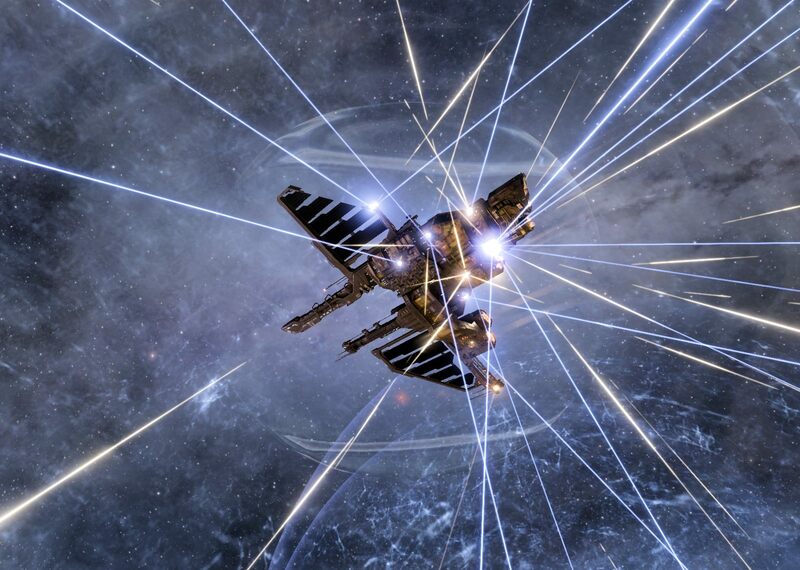 It was set to hit at a little after 19:00 EVE Online time, which is UTC. However, because fleets had to move and get in position, the call to form up came a good four hours before then. That was before I got out of bed here on the west coast. I turned on my computer to find fleets already forming and heading out from Delve. But that was okay. I wasn’t interested in heading out with main fleet for the long drive there and back to visit CO2. I hung around waiting for something to form up in Pure Blind. And I was rewarded for waiting with a fleet ping from Dabigredboat. Some might not consider that a reward. Boat can be an acquired taste. But he works hard, gets you in the action, and tells you what is going on. Plus, he was handing out free ships. We were going to head out in Tengus to snipe targets of opportunity and run down disconnects. I was happy enough to be in a Tengu again that I bought the snappy new Ghostbird SKIN for it. Meanwhile I already had an alt online in a stealth bomber in DW-T2I to watch what was happening with the Keepstar and the system in general. CO2 had been busy. Both of the gates into the system were heavily bubbled, so any fleet trying to gate in to contest the timer would have to get past that. 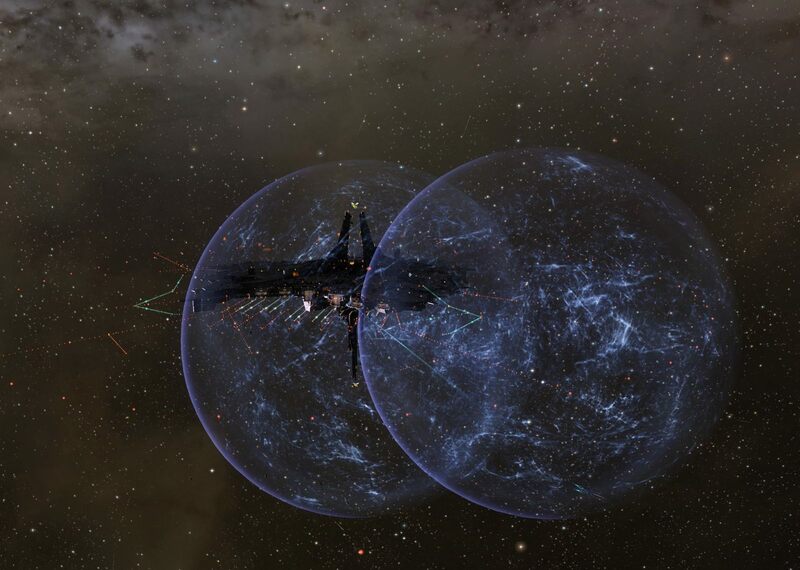 You can just barely see the Keepstar in the background of that screen shot, through the dense layer of bubbles laid about the gate. The array of bubbles was big enough that if I pulled back to get them all in the screen shot, the gate and the small bubbles around it become difficult to see. Everything seemed to be coming together for a big fight. While Boat was arranging a black ops bridge up to DW-T2I my alt sat and watched CO2’s allies start to show up. Darkness and their coalition brought a Tempest Fleet Issue fleet. Ranger Regiment brought an Ishtar fleet. NCDot brought a Machariel and a Cerberus fleet. CO2 undocked a fleet of Megathrons. And capitals began to form up about the Keepstar. Boat got us a bridge into system and we went off to safe spots to cloak up and wait for something to do. In system Boat was keeping us up to date about what was going on while also looking for something to shoot. We went and tried to pick off some transports that were parked near the O-CNPR gate. We didn’t get a kill, but we scared them off at least. Then Boat said we were going to go try and shoot the cyno jammer in system. 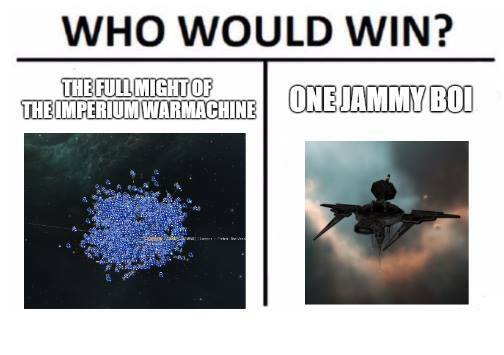 This was the first of many times I would hear the words “cyno jammer” during the op. Boat explained that the previous day and evening the Imperium spent time putting up POS towers on every free moon and reinforcing the towers that CO2 or anybody else had deployed in the region. This was to keep a cyno jammers from being deployed. 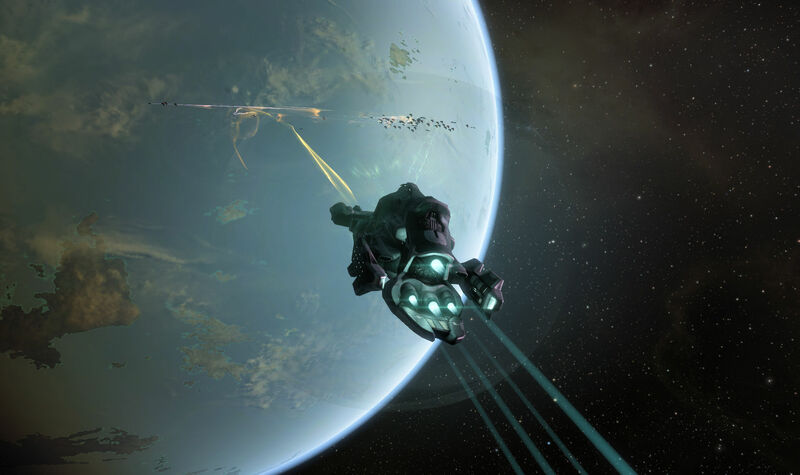 A cyno is a beacon which lets ships with jump drives travel to it. You need a cyno lit in a system in order to jump into it. A cyno jammer, as you might imagine, blocks cynos from being lit. The ones on a POS jam the whole system, and CO2 had one in DW-T2I. 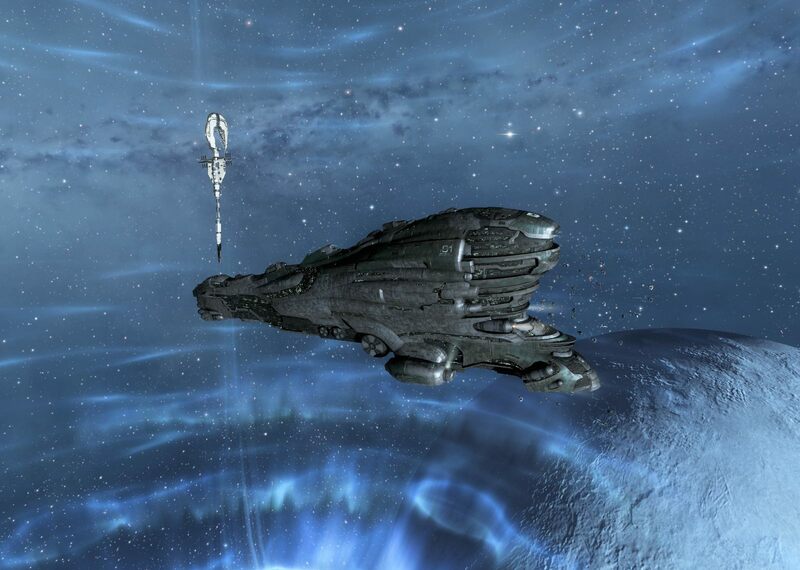 So Boat warped us over to the POS with the cyno jammer and had us start shooting it. Very shortly a Minokawa force auxiliary logged on just outside the POS, close to the cyno jammer, and started to repair it. CO2 had prepared for an attack on the jammer and, later, more Minokawas were spotted on the POS. The Minokawa was repairing faster than we could inflict damage, so Boat warped us off and we went to our safe spots again. As we sat around I turned up the volume on the INN stream of the event and heard Boat talking about the situation. There, and on our own coms later, he explained that somebody running the preparatory ops believed that cyno jammers would not function on reinforced POSes. This turned out to be a fairly wide-spread belief. Progodlegend, on the same stream, said that they had just done the reinforce thing to Fraternity recently. However, it appears that Fraternity just didn’t try anchoring a cyno jammer on a reinforced POS, no doubt because they believed the same thing. GigX however, knew better it seems. If we had known some simple contingencies could have been put in place, like leaving behind some logged off dreadnoughts to knock out the cyno jammer quickly to let fleets start pilling in. But we didn’t so we were stuck. That left the only way in to the system for the converging Imperium fleets… with more capitals on the way than the defenders had ships on hand… with one way into the system; through the O-CNPR gate. But, as I mentioned, that gate was heavily bubbled. Yes, you cannot possible read that unless you click on it. But among the things on the list were 425 battleships, 124 super carriers, 35 carriers, 683 fighters from the carriers and super carriers, 504 drones from various ships, and a titan. So while it was possible that the Imperium could have thrown everything through the gate and eventually muscled past the defenses, it was going to be a slog. Defending on a bubbled gate like that is referred to as “water boarding,” because it is torture that the attackers cannot escape. With more bubbles no doubt set to be deployed and inderdictors on the field, a hostile fleet could be kept writhing in that mess for hours. Certainly they could be held in check until the repair cycle on the Keepstar finished up. Instead everybody turned around and went home. That was it. GigX won the day and saved his Keepstar. As far as I can tell the biggest fight in the whole event was a smart bombing drop by NCDot on an Imperium Jackdaw fleet. They did kill a lot of ships, 64 according to the battle report. 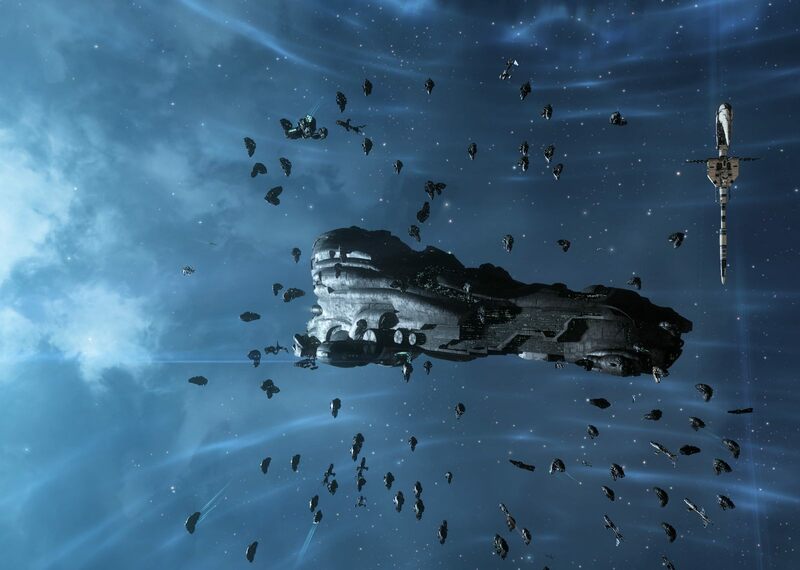 However, they lost 20 of the black ops battleships they used, destroyed by their own fleet’s smart bombs, which left the cost of the operation at roughly ten times the ISK of the hostiles they destroyed. Not a good trade. That was fine for everybody else. However those of us in Boat’s fleet were still in the system and he was on the INN stream talking about events as they unfolded. However, the stream wrapped up pretty quickly once it was announced that the Imperium was not going to show up. Boat did not forget about us, though he forgot about his titan in the super fleet for a bit and almost got left behind. He got a black ops battleship in to send us all back to Pure Blind, staying behind to cover two people who had gone AFK long after some FCs would have left them to their fate. I got one last look at the Keepstar before we bridged out. I was glad again to not have schleped all the way up from Delve in a Baltec fleet only to have to turn around and go home again. But that was still shorter than having a fight before the return trip, so a bunch of people got some of their day back. The Mittani held the weekly Fireside Chat on coms where he explained what went wrong and how we were going to go back to doing things the old fashioned way, grinding and suppressing the region until CO2 retreats. Not our most brilliant hour. Reddit will be filled with comments about Goons being dumb and not knowing POS mechanics for a while. But everybody knows about that POS mechanic now for sure, so if if anybody else falls for it… well, more of the same on Reddit I suppose. So the war goes on. 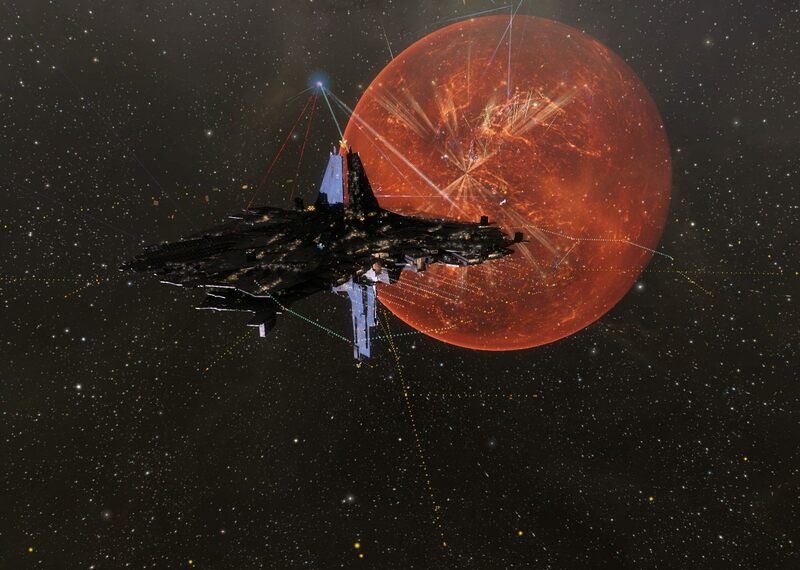 We still have a Keepstar of our own on the border of Fade and SIG and Squads are still roaming north from Pure Blind. 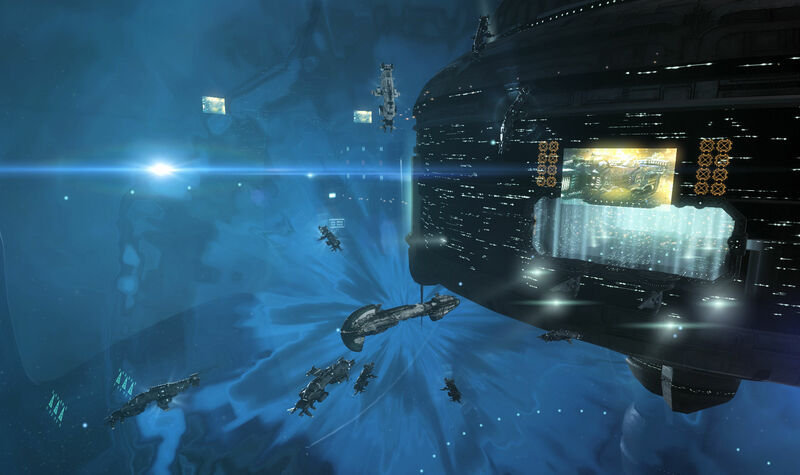 The fun is not over, but it may be a while before we pave our way to the Keepstar to do anything more than keep it reinforced. I suspect we’ll keep reinforcing it to ensure that CO2 can’t pack it up and move away. Meanwhile there was no saving the TEST Keepstar down in 4-GB14 in Immensea. They couldn’t even use GigX’s cynojammer trick since hostiles had already grabbed the ihub for the system, and if you don’t own the ihub you can’t setup a cynojammer. 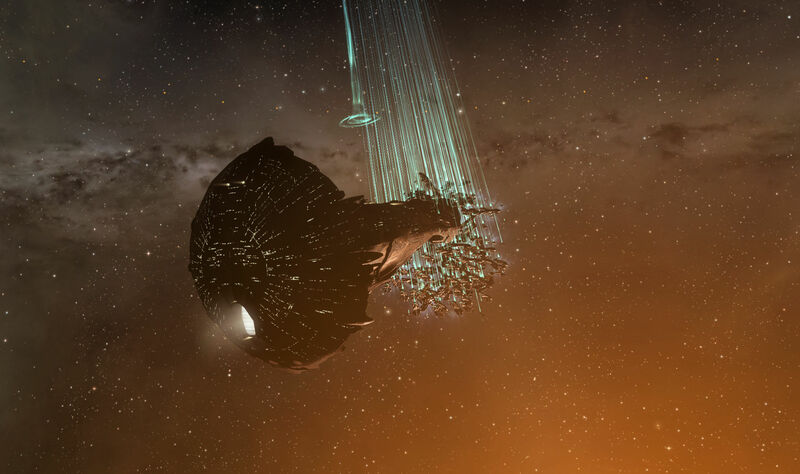 And so that Keepstar died. 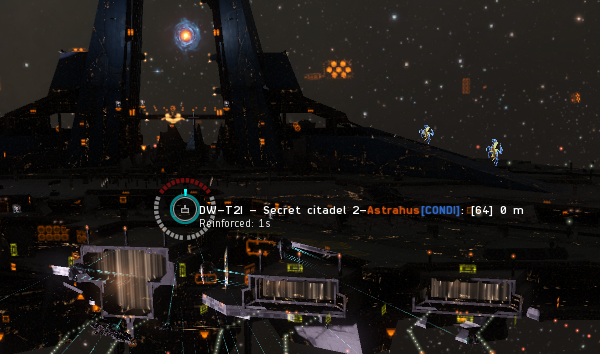 It wasn’t their capital Keepstar, but losing one hurts no matter what. 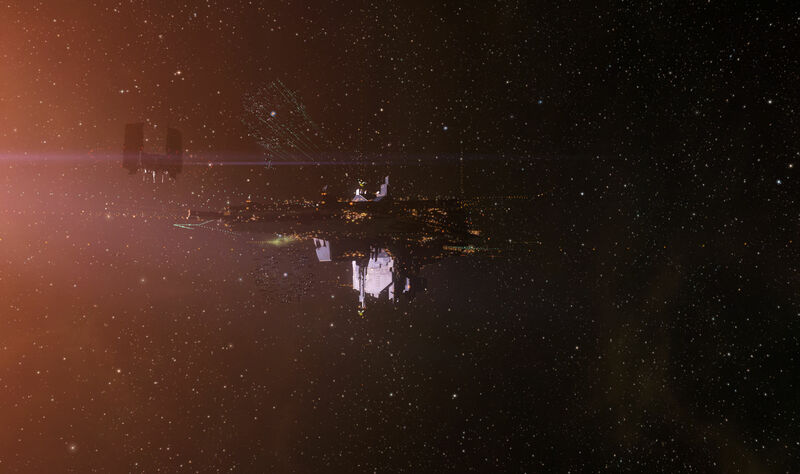 And then there was the Provi Bloc Keepstar, anchored down in 9UY4-H, which went online successfully. This event also involved a cyno jammer, that being the EVE Online word of the day. Hostiles sacrificed dreads to incapacitate it, but Provi just finished it off and anchored a fresh one, leaving the attackers without an easy way in. Even being able get the cyno jammer offline doesn’t mean you’re good to go. 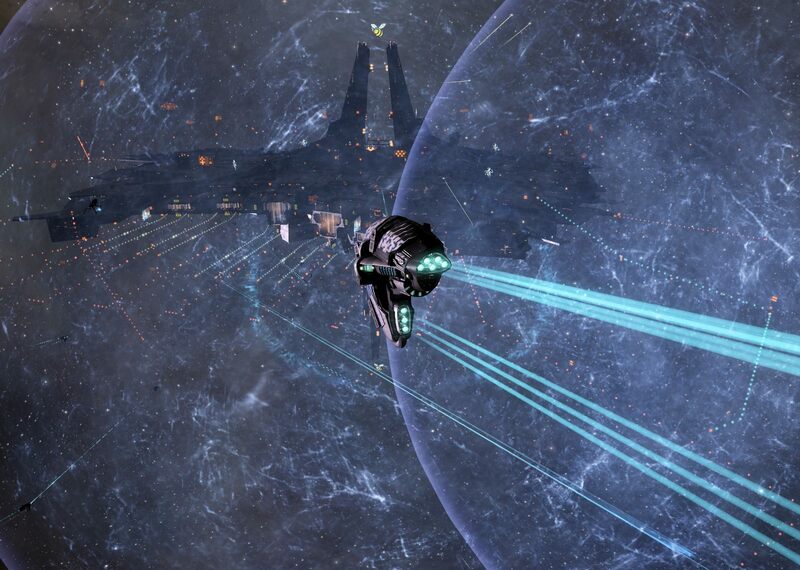 So it was quite a day for null sec Keepstars, with one successfully defended, one destroyed, and a new one online. And we all know just a bit more about POS mechanics, just in time for them to go away at some point in the near future. 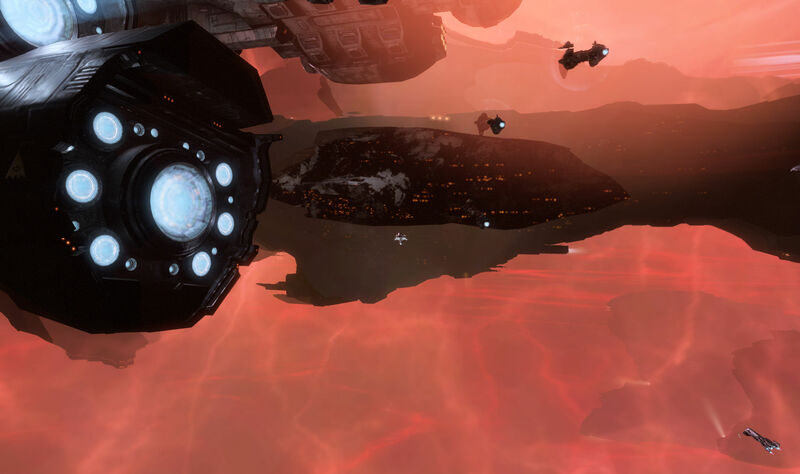 This entry was posted in entertainment, EVE Online, Null Sec and tagged 4-GB14, 9UY4-H, Circle of Two, DBRB, DW-T2I, Fade, Imperium, Keepstar, Providence, TEST on July 15, 2018 by Wilhelm Arcturus. As expected, with our own Keepstar safely installed in 6RCQ-V the night before, operations directly against Circle of Two in Fade began. 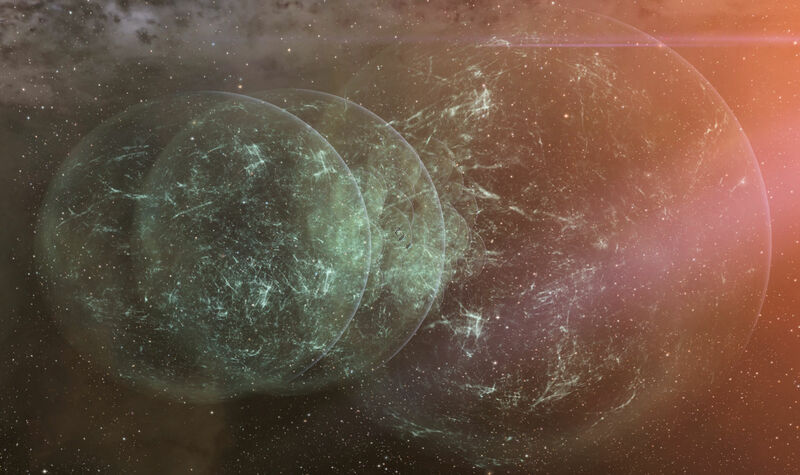 Fade is not a big region, and while CO2 also holds a bit of Pure Blind as well, the bulk of its holdings are in Fade, including its capital and Keepstar in DW-T2I. 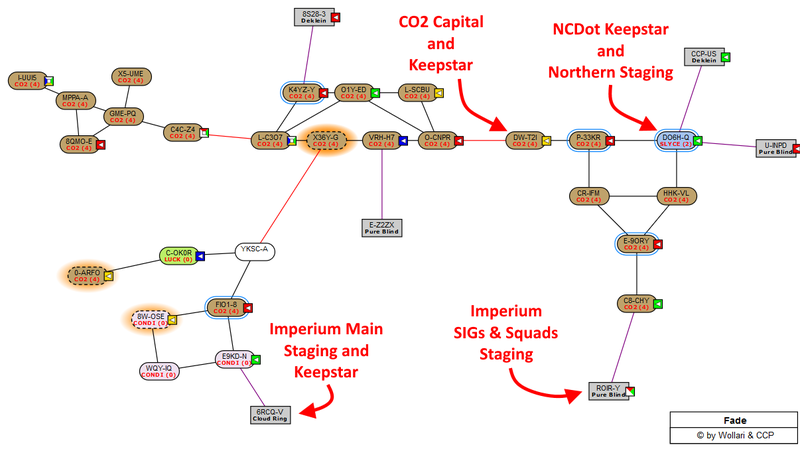 So that system and Keepstar are not far from where the Imperium’s own Keepstar is now planted as well as being close to NPC space in Pure Blind where Imperium SIGs & Squads have been based for the last few months. 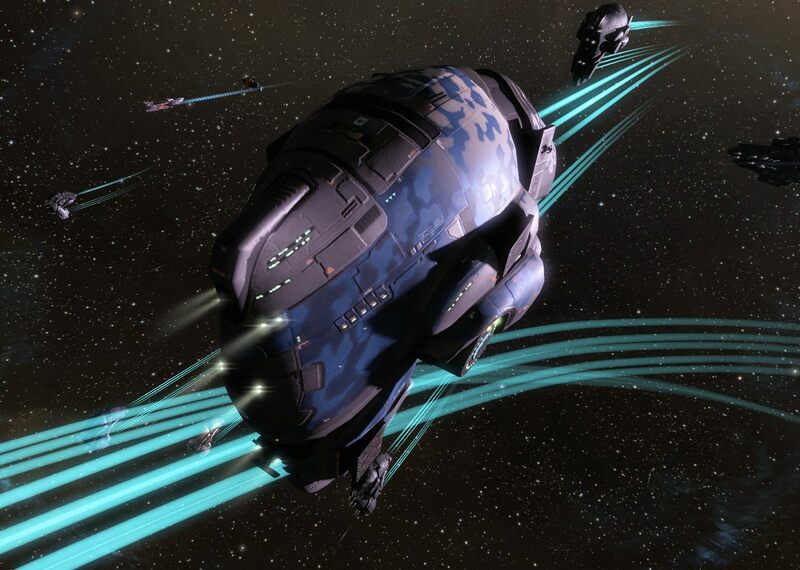 Fleets were called up for various tasks last night, including Reavers. I actually missed the initial ping, but reports were that nothing really happened and I managed to get online and catch up with the fleet as we headed off to DW-T2I. There we hung out for a while on one of the Raitarus we have anchored in the system, waiting to see what CO2 would do when another group started shooting their Keepstar. While somebody was at the helm of the Keepstar and using its weapons to hit the attackers, no resistance showed up in ships, so we were allowed to run off and shoot something on our own. Our target for the night was the Draccous faction Fortizar that replaced the station in system when CCP did the great outpost conversion back in early June. We approached this with some caution. 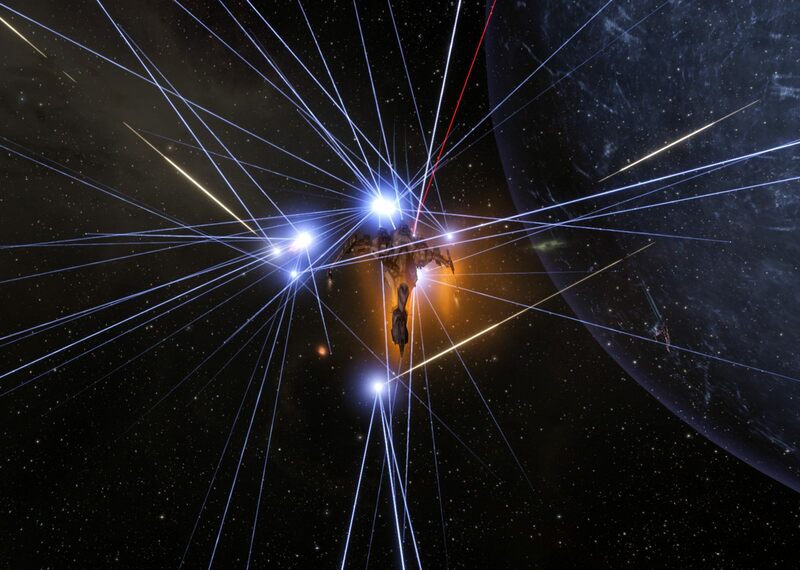 We were not a big fleet and a Fortizar’s defenses are not without teeth. But nobody was at the helm and when scanned we found that only the default fittings that came with the conversion, the rigs and services, were there. Without defenses we were clear to fly around and let our drones reinforce it… and goof off a bit. Aside from a lumbering point Proteus falling behind the fleet… somebody may have webbed him… the shoot went without incident. The armor timer was set to go early on Saturday. After that we warped over to the gate that would send us in the direction of home. 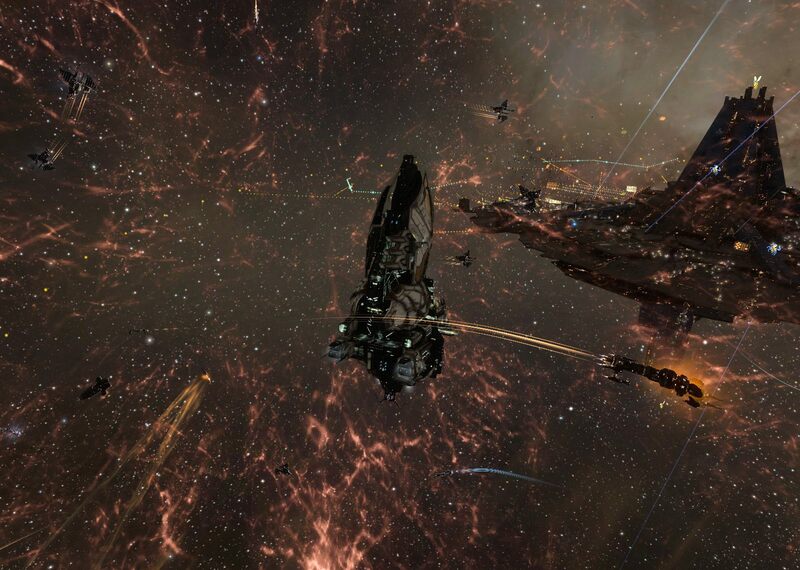 That gate is on grid with the CO2 Keepstar and we stopped to watch the attacking fleet for a bit. There were some titans with fax support with Megathrons and Ravens along for the shoot as well. 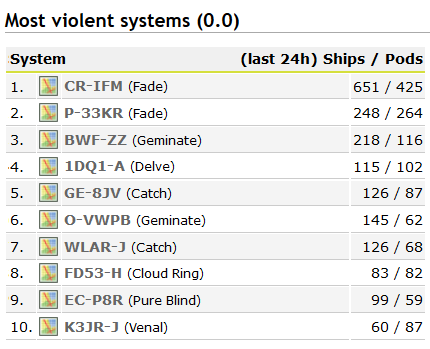 Looking at the related kills over on zKillboard, it looks like the Keepstar defenses were able to pick off some of the battleships, but none of the capitals were in danger. And, looking at some of the kills, at least one was blue on blue. I don’t know what Kun’mi did, but all the pilots on the kill mail for his Nestor are in the Imperium. The Keepstar didn’t have much further to go. It was down to the last few percentage points of shield when we arrived, so we saw a bit of shooting before it was reinforced. After that we were off for home, the evening’s work done. The next attack, the armor timer, is set to come out on Saturday… if I am doing my calculations correctly… at about noon Pacific time, which is 3pm Eastern time, or 19:00 EVE Online time. that makes it an evening event for the Euros and an afternoon fight in USTZ. This puts the fight in contention with the final timer for the TEST Keepstar down south, so I suspect many of the possible allies of CO2 will punt on the armor timer to get in on a potential Keepstar kill at the other end of New Eden. We shall seem come Saturday. Meanwhile ops continue in the north to suppress the locals and reinforce other structures they have about. 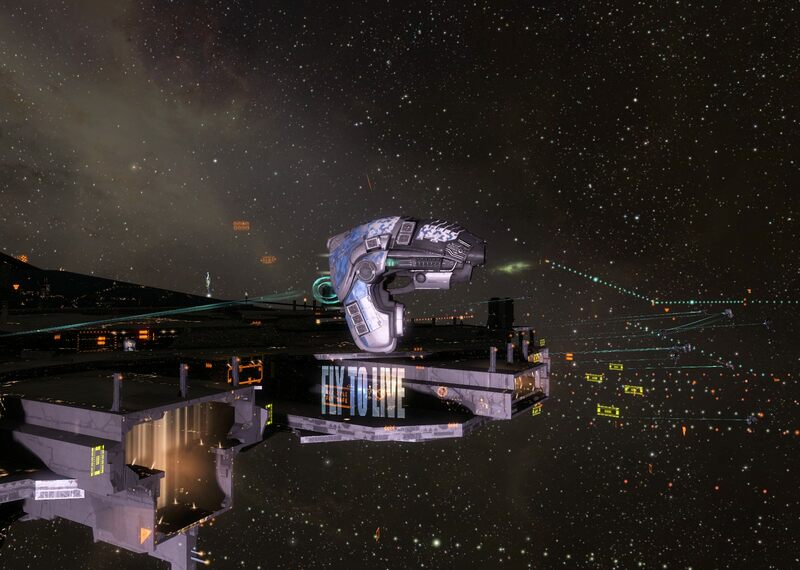 This entry was posted in entertainment, EVE Online, Null Sec and tagged Cainun, Circle of Two, DW-T2I, Fade, Keepstar, Reavers, Zed Starshine on July 13, 2018 by Wilhelm Arcturus. Once more into space went our VNI fleet, undocking for another foray into harms ways. Another Astrahus timer was set to expire where we were the other night, DW-T2I in Fade. The op had been announced well in advance so I was ready and resupplied. I even had a new SKIN for the VNI, having had SKINs on the mind with the advent of the CCP Blaze memorial SKIN set, which I also picked up. 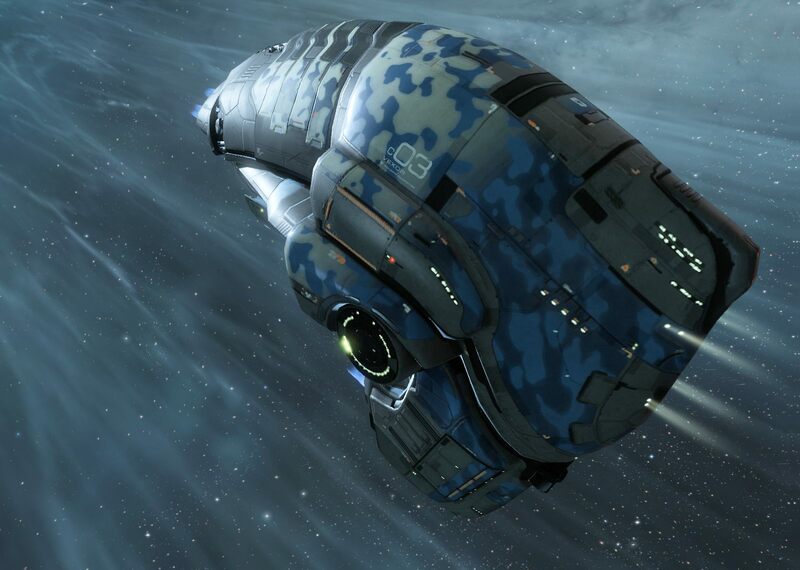 The Glacial Drift SKIN was readily available in Jita for a reasonable price, so I grabbed that for the op. As these things go, we got ourselves together and out on the titan to wait for our ride into the fight. One more trip into the POS shields. Some day… maybe even some day soon… that will no longer be a thing in New Eden. There aren’t many roles left for the good old POS, aside from hiding titans and anchoring jump bridges. We waited a bit, but the call to take the bridge came as the blue effect swirled about the POS. We jumped, landing on the Astrahus in DW-T2I. We were there just in time as the counter ticked down to the appointed hour. The enemy had not yet appeared as the timer rolled over and the repair cycle began, but that situation did not last for long. 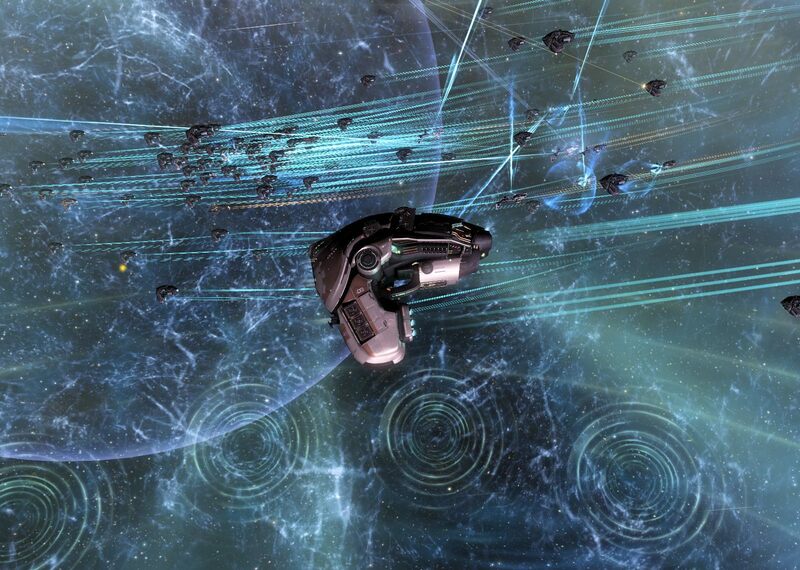 Soon Pandemic Horde dropped just off the citadel with the expected Tempest Fleet. As they had previously, they came with an Apostle force auxiliary for reps. In addition they had reinforcements from their allies Guardians of the Galaxy coalition in the form of a Cerberus fleet. We had a bit of support of our own, which arrived as the fight kicked off. Asher set us up to hit the Tempest fleet first and we were able to pick off some choice targets almost immediately, including a pair of Basilisks, a Vulture, a Tengu, and a Cerberus that strayed too close to us. However, they managed to get webs on Asher long enough to slow him down and pop him, which put us off our stride. We went to a secondary anchor, shot a few Tempests, and then had to warp off as our drones we getting shredded. Along the way I was red boxed by the Tempest fleet, but speed and our logi support saved me. Meanwhile, a Jackdaw fleet that had flown up from Delve joined in the fray. 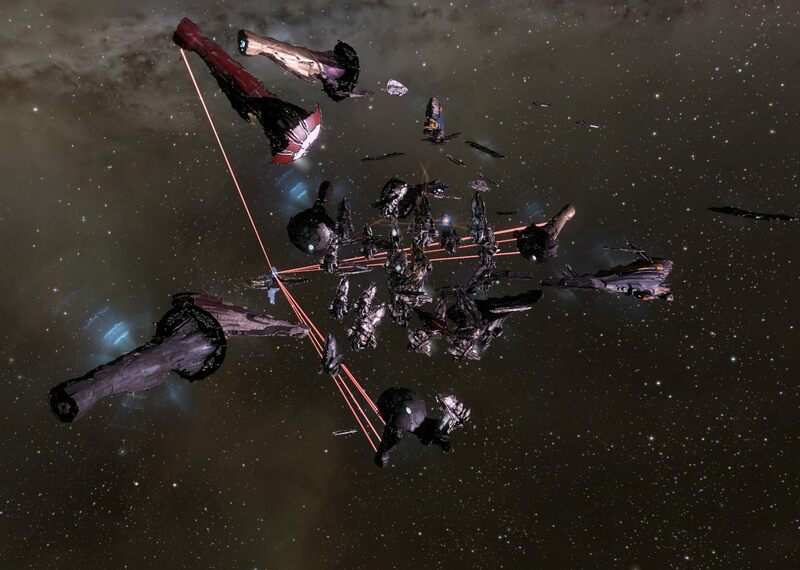 Also present were some bombers from The Initiative who were fresh off their server first Guristas Sotiyo kill. After waiting out our aggression timer on at a safe, we docked up in the Astrahus to swap fresh drones into our drone bays from cargo. Asher meanwhile had reshipped and rejoined us, leading us back on grid to the fight. For this round we stayed at the edge of lock range in an effort to avoid getting webbed again. Our survivability depends on keeping our speed up to avoid being hit by the battleship guns. That made our ability to engage a bit dodgy as our drones had a long way to go and the Cerberus fleet, or target for this round, hove in and out of lock range. A number of times we would get drones on a Cerb only to have it move out of range, though our drones would keep attacking. During that engagement I managed to get the kill mail on one of the Cerbs. It was pure luck, as these things tend to be in fleets over a certain size, but it did give me a third kill mark on my VNI. We kept at it and were able to take down a string of Cerbs though, once again our drones were getting chopped up. A smart bombing Machariel was in their midst, taking its toll. I lost my full second flight of heavy drones and towards the end had only my two backup heavies engaged. We were not able to do much versus the Tempest fleet at that point, and they kept on hitting the Astrahus, eventually winning the timer. That advanced the assault on the citadel to the final round, the fight to destroy it, which initiates six days hence. At that point the main event was over. We docked up in the citadel again to move whatever drones we had left in cargo over to our drone bays. That meant some sentry drones for me. The hostiles hung around a bit then started to warp off. However, a few of them were too close to the structure model and ended up bumping it while trying to align out. 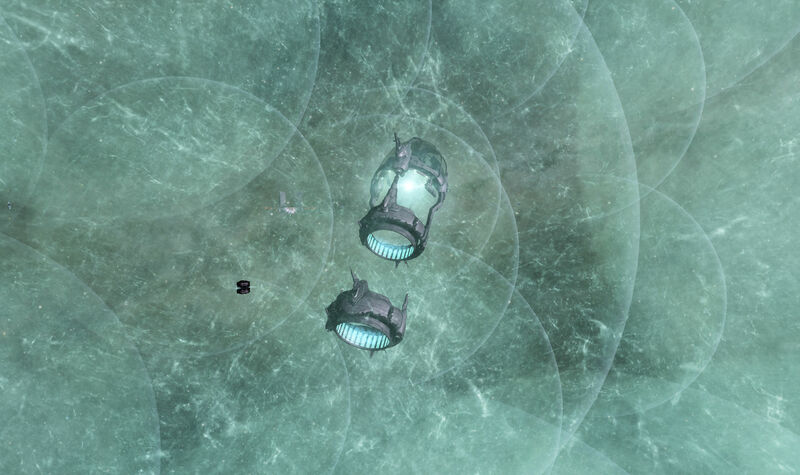 A Sabre of ours outside the Astrahus, waiting for just such an opportunity, put up a bubble to hold them and we all poured out of the citadel, launched our reaming drones, and picked off the stragglers. That netted us a couple more Cerbs, a Loki, and a Scimitar to finish off the evening. Then people began to loot the field then pop wrecks to keep the enemy from picking over the remains. A daring Ibis and a Catalyst warped in and out looting and salvaging, staying just out of our reach. I moved back to pick up my sentry drones and waited for the trip back to our staging. So the fight was a bit of a split decision. The enemy achieved their objective and sent the citadel into its final timer. However, the results of the battle show the ISK war coming out very much in our favor in a fight where we were, once again, out numbered. 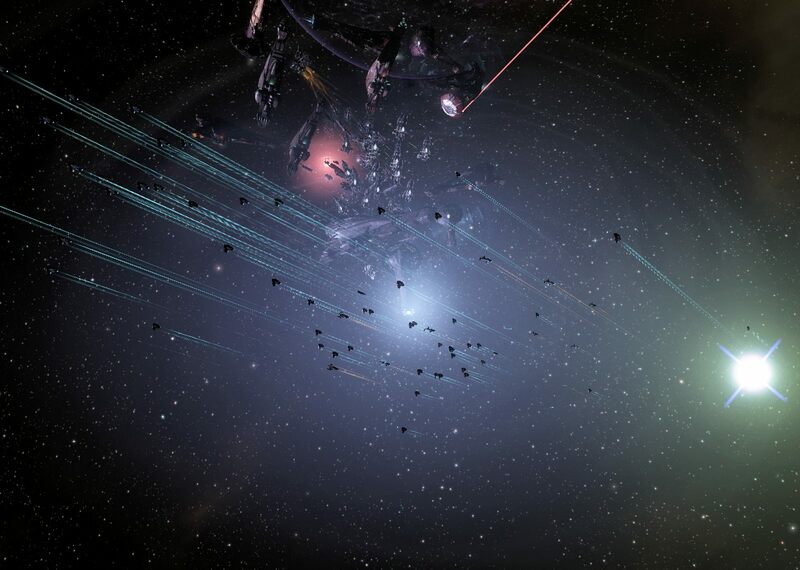 We lost about 6.6 billion ISK while blowing up more than 13 billion ISK in hostiles. As I hung about waiting for the run back to staging I managed to catch a screen shot with an ad running on the Astrahus that seemed amusing. My ship lived to fly another day. We shall see if the VNIs undock again for another fight. This entry was posted in entertainment, EVE Online, Null Sec and tagged Asher Elias, DW-T2I, Reavers on December 14, 2017 by Wilhelm Arcturus. I suppose a cargo hold full of extra drones might count as refits. Maybe. But there we were last night, undocking in our VNIs, loaded with drones, and off to fight over timer on another one of the citadels that had been scattered about the north for just such a purpose. We keep this up and people will start copying this doctrine soon. Resupplied with drones, drugs, and fresh hulls for those who lost theirs the night before, we undocked and got on a titan, pilots from TNT increasing our numbers, to wait for our bridge into the fight. 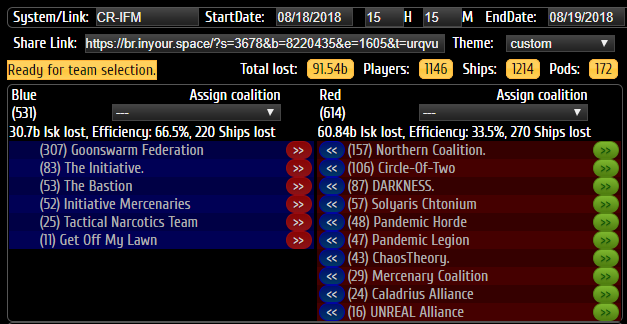 We were jumping back into DW-T2I, where we had successfully defended a timer previously, slicing up a Pandemic Horde Tempest fleet without any losses on our side. Of course, that time PH fought the battle themselves and the odds… at least in the number of ships, leaving aside we were in cruisers and they were in battleships… were as close to even as makes no difference. This time we jumped into DW-T2I to find that PH had called up their local friends, the effectively blue neutrals (bluetrals), to ensure things went their way. The numbers were stacked heavily against our VNI fleet when we arrived and tethered up on one of our citadels in the system. 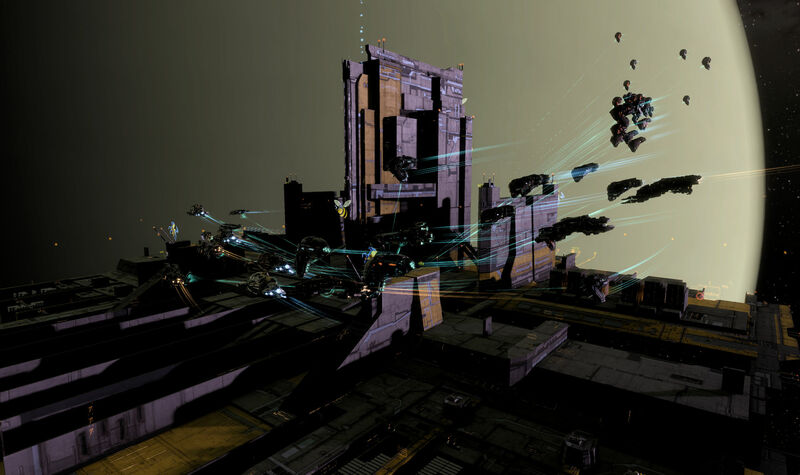 There were an array of fleets from PH, Guardians of the Galaxy Coalition, and Mordus Angels in the system, ranging from destroyers to capitals. The directional scan from Moomin did not look good for us. 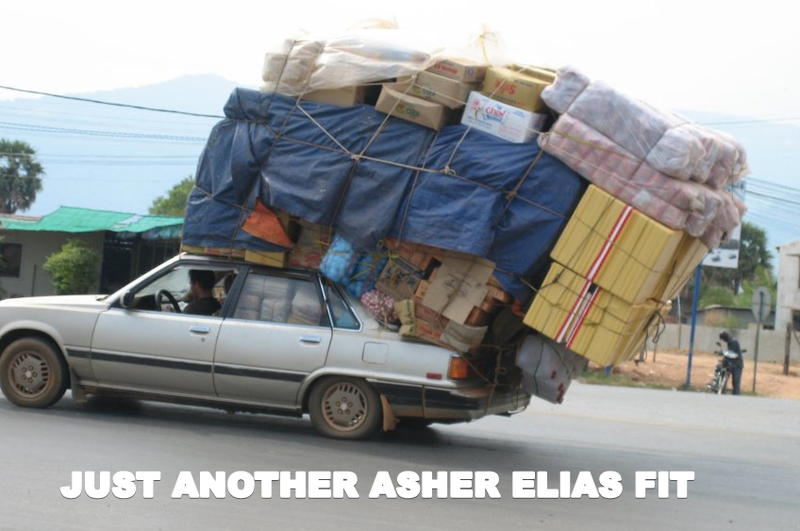 As Asher assessed the situation for us on coms it sounded like we were just going to give it a pass and go home. Then the timer for the Astrahus came out and the gunner, Gennel, who had successfully made the hostiles pay for getting to close to his weapons in the past, started pasting hostile force auxiliaries that had nonchalantly gone into triage mode within his reach, with an Apostle exploding almost immediately. Taking out the support that the capitals had brought with them and scaring them off the Astrahus grid seemed to change the situation for Asher and we were called to align then warped to the now besieged citadel. We were safely tethered there when he called for us to anchor on him with propulsion modules on. We launched drones, unthethered, and began hitting Tempest Fleet Issue fleet that GotG had brought. A quick dozen targets were taken out and we were feeling pretty good about things. Our speed and low signature kept us reasonably safe while our drones chopped up one target after another. A bombing run caught us at one point, but did not hit us full on, so we kept going. We were still clearly going to lose the Astrahus, but we seemed on the path towards extracting greater value in ISK from the enemy in faction battleships and force auxiliaries. The hostiles were not done escalating however and we soon saw titans with a large group of force auxiliaries in support drop on grid with us. Asher aligned us off to a safe to let our weapons timers run down, then put us on a citadel, our drones left behind as we exited the scene. Titans were definitely not within the realm of possibility for us, and certainly not ones that might be mounting any of the fun new anti-subcap doomsday weapons. Asher had us dock up and reload our drone bays to replace any lost or left behind drones while the titans hit the Astrahus. That is, of course, the problem with running into somebody elses’ home turf. They have the opportunity to drop anything they have to hand on your, including supers. We had that issue during the operations in Hakonen back during the summer. Asher had us align back and we landed on the soon-to-be-destroyed Astrahus, tethered again, and anchored up for another run at targets of opportunity. We had to warp out almost immediately, causing some of us to lose drones (I was lucky to get 4 out of 5 back). We landed, aligned back, and gave it another try. With drones launched again we were able to knock out another half-dozen GotG TFIs and got to see the Astrahus gunner pick off an fax in the midst of the titan ball. All that would have been well and good, but along the way a Hurricane fleet that had come all the way up from Delve to join us in the fight arrived and basically fed the enemy 70 kills, including some very expensive implant pods. That slave set didn’t really help. Local was actually up beyond 700 people at its peak and time dilation kicked in, dipping to under 20% speed at times. But by that point the fight had passed its crescendo for us. We ended up warping to safes, leaving behind more drones, then docking up in one of our remaining citadels as the titans finished their work. We waited a bit for things to settle down, then took gates home, unmolested by any of the defending forces who were still about. Our little fleet did fairly well. We lost less that 20 ships, including support, and inflicted some damage on the Tempest Fleet Issues on grid. However, in the final accounting of the battle over at zKillboard, all of the usual measures went against us. We lost the objective, with the defended Astrahus, plus two citadels coming online, all destroyed. (The Astrahus only had supers on its kill mail.) 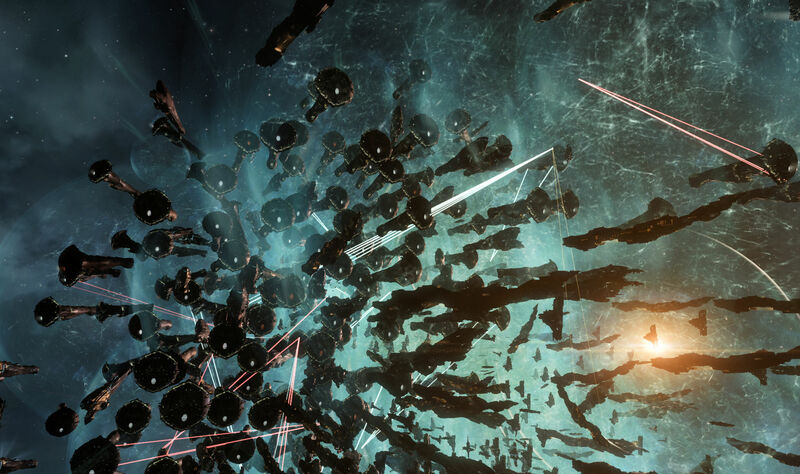 Meanwhile the ISK war went badly for us once you count in the destroyed Hurricane fleet which totaled up to nearly 6 billion ISK in ships and a further six billion ISK in pods. (Okay, not every expensive pod was in their fleet, but they own the lion’s share of that loss.) And we simply lost more ships overall, again with the Hurricane fleet providing the bulk of that metric. And yet it still felt like a win to us. Our little fleet, about 100 ships all told, heavily outnumbered, and with no chance of changing the eventual outcome, sailed into harms way and gave better than it took. Sometimes a desperate fight you know you’re going to lose is more fun than the objective outcome would make it. Anyway, time to restock drones in my drone bay in case the VNIs fly again. 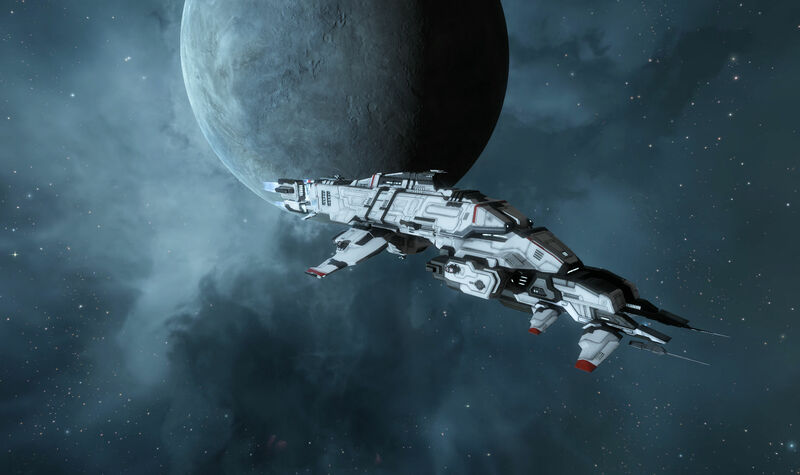 This entry was posted in entertainment, EVE Online, Null Sec and tagged Asher Elias, DW-T2I, Fade, Reavers on December 12, 2017 by Wilhelm Arcturus.